Barbara Groves and Mary Jacobson are ALL about simple: simple fabric choices, simple cutting, simple sewing. So you can rest assured that the patterns in their two books on Layer Cake quilts—Easy Layer-Cake Quilts and Easy Layer-Cake Quilts 2—are a cakewalk! 1. Fabric picks are a no-brainer—all the squares in a Layer Cake are designed to coordinate. Done! 2. Cutting time is, well—cut! And the cutting guides that Barb and Mary include with every pattern show you how to cut your fabrics so waste is at a minimum. 3. Sewing time . . . Well that’s where the fun REALLY begins! The sisters work their patchwork magic and you simply follow along, step by step. Sewing with the sisters is a piece of cake! 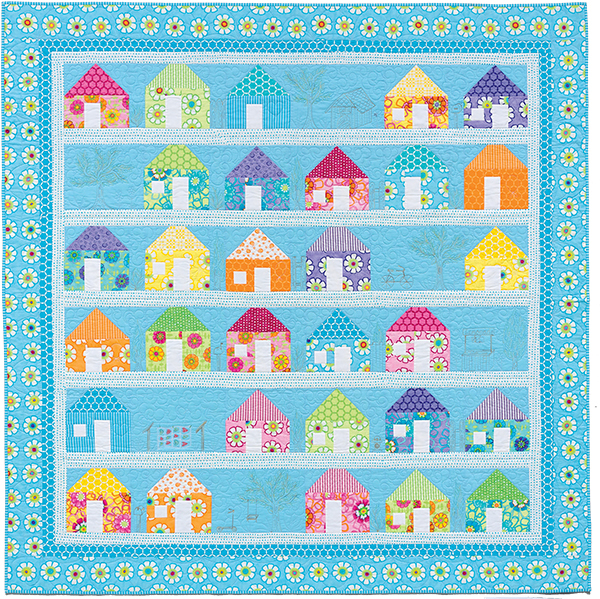 Suburban from Easy Layer-Cake Quilts: Barb and Mary added fun machine-quilted motifs in between the houses, including a clothesline and a bicycle. So cute! On the 45 from Easy Layer-Cake Quilts 2: simply divide Layer Cake squares in three equal portions to make this lively design. 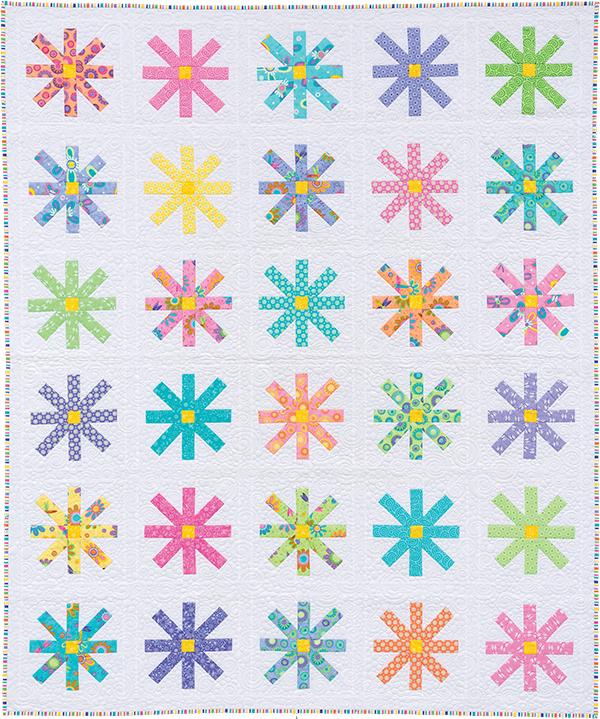 Flower Power from Easy Layer-Cake Quilts: don’t let the design fool you—it’s a snap to grow this garden! Of course, Barb and Mary are fabric designers for Moda too—their bright color palette is instantly recognizable and always makes us smile. If you love their style, you are going to love our giveaway today! Win a copy of BOTH of the sisters’ Layer Cake books PLUS a Frolic Layer Cake from Moda! What do you love most about Layer Cakes? Instant coordination—fabric selection is so much easier. I don’t have a Layer Cake yet, but they sure look yummy! Share your answer in the comments and you’ll be automatically entered into our random drawing. We’ll choose TWO lucky winners and we’ll notify you by email if you win. Good luck! 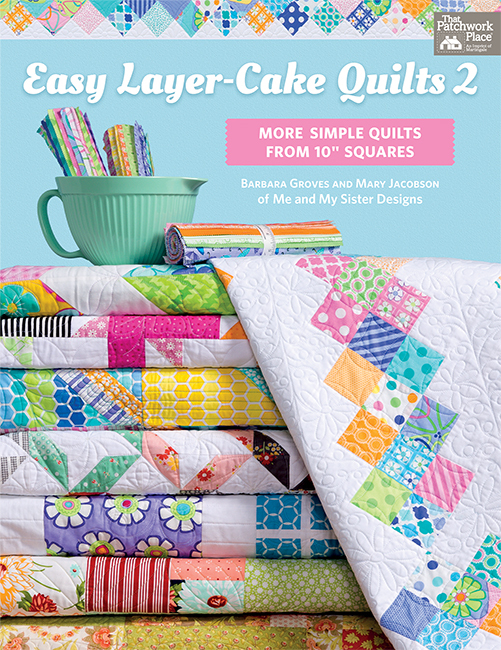 And if you’re ready to start baking a Layer Cake quilt with Barb and Mary today, you can order Easy Layer-Cake Quilts and Easy Layer-Cake Quilts 2 at our website and we’ll send you an email to instantly download the eBook versions for free. Thanks to all who entered the drawing! The winners are Alice and Jan.
We’ll email you about your prizes, winners—congratulations! International Picnic Day is June 18 🌞 choose an easy picnic quilt to make! I love that you get a variety of prints in a size that you can use for multiple blocks. Charm packs are great but sometimes I need just a bit more of a print for the project I am working on. Using the layer cake to make a double wedding ring quilt has never been easier! I love the variety of fabric in a layer cake! I make all my baby quilts with Me and My Sister fabrics, I don’t do pastels! I like layer cakes because they coordinate. I actually do not buy layer cakes often – I really am not sure why – I guess I would buy them as you could cut larger pieces when needed compared to the smaller precuts. What I like most about layer cakes is that they give me a quick way to get a variety of different prints, and they are big enough to really admire each print. To pick from your list, I will say they are coordinated, which helps me learn how to coordinate, and try out the patterns/colors I wouldn’t normally work with. They are easy to store, cut up into all sorts of combinations, and make for fast quilts to share. I like the wide variety of prints in a layer cake, but generally I don’t buy them because they are not accurately cut. I like the convenience of having the fabric already cut out. I also like that there are so many different fabrics in the layer cake. It is great to have the instant colour coordination and layer cakes are great for the amount of fabric they contain. It always amazes me how far a layer cake can go. I love the instant coordination AND they are ready to go so more time sewing! Plus, no calories!!! What I love most about layer cakes is you have a ready made stash of a variety of different fabrics that all co-ordinate with each other. As well you have the option of using the layer cake as 4 charm packs in a pattern. They are large enough to show off lovely prints and fussy cut if desired, and coordinated, so it’s easy to finish a quilt. Thank you for the chance. I love that they are so easy to use with far less cutting, and the fabric selection has been done for us. Keep up the great work, you have such awesome books. I love that you have a variety of fabric that all coordinate and they are precut and easy to work with! I love how the fabrics are coordinated and you can just get sewing!! They give variety with harmony. Instant coordination—fabric selection is so much easier. I love having enough fabric to make a project in the larger pieces than a charm pack. I’ve never used a layer cake, but I think they are brilliant!! I love precuts. What I love most about 10″ precuts is that you get so much more of the pattern of the fabric. When I can’t afford yardage, I love getting pieces of a fabric collection I couldn’t have otherwise. Also love getting coordinated fabric I can just grab and sew. The fact that the whole layer cake is already coordinated is why I like layer cakes. They are great for beginners who feel intimidated by trying to choose fabrics for a quilt. I don’t have a layer cake. Looks yummy. I don’t have any layer cakes yet but I do agree they look yummy! I love the fact that the fabrics are coordinated. I’ve only used a layer cake once but would love to try more. I have a layer cake set that is beautiful but I have no clue what to do with it. Any help would be greatly appreciated. Your ideas look GREAT! I love the way the fabrics all coordinate and how they look together in a top. Layer cakes are the most versatile cut. They can become strips, squares, or just work as is. I love the variety of prints in each one. They add character to the quilt and I didn’t need to spend hours choosing fabric! Already coordinating – ready to sew in blocks or cut into smaller pieces with out all the extra fabric to manage! Less cutting, more sewing. I love having the pieces come together so quickly! I love working with Layer Cakes! Nice selection of fabrics in collections as well as the opportunity to make so many different patterns with them. I’ve made the Around the Block quilt and no matter what LC I’ve chosen, they all look fantastic! I love the fact that layer cakes give you coordinated fabric and there are so many patterns out there for you to use! Instant coordination is the best part of layer cakes. I don’t EVER EVER EVER have to worry and something not matching! I love the layer cakes because they are easy to use. And fabric selection is so much easier for me. Thank you. I love how versatile they are. So easy to use and perfectly coordinated. They are by far, my favorite precut. I don’t have any layer cakes yet, I have one jelly roll, and a few fat quarter stacks, but I keep looking at the layer cakes. I like the coordinating colours! Easy to make a quilt! With the exception of "I don’t have a layer cake yet", the answer is "all of the above"! And now that there’s the Cake Mix (triangle paper) recipe cards, layer cake bundles are even more attractive. Like their charm pack predecessors, betcha’ can’t buy just one! I love layer cakes! The convenience of a precut saves me lots of time and the accuracy I get when I subcut makes my points look so much better! I am always on the lookout for good patterns to use with layer cakes. I always like meeting Barb and Mary (3X).Delightful ladies! Less cutting and all the fabrics go together. As a precut, layer cakes are my favorite, mostly because they give you a nice sized selection of an entire fabric line. Also enjoy the ease of cutting. I haven’t sewn with layer cakes yet, but it is on my list of sewing projects to do. Layer cakes are my favorite precut! To me they are the best size and most usable– easily becoming a charm pack size or jelly roll strip. My 3 year old granddaughter would love a quilt made from the Frolic layer cake– they are the perfect colors for her bedroom! 🙂 Thanks for the opportunity to win! I love that it saves me time. I fret over choosing coordinated fabrics. Now I don’t have to. Love all the yummy co-ordination of precuts, it makes it easy to add from my stash and have it all "work". I love the instant coordination! It’s hrearnro have a little bit of an entire line! I haven’t used too many layer cakes. I love the idea of having a whole collection in front of you to mix things up. I’ve never used Me & My Sister’s collection but always have admired the bright colors. This would help me step out of my comfort zone and have some fun. I love pre-cuts because all of the material coordinates; you don’t have to buy yardage of several prints from the same line, you get ALL of them. I would love a layer cake and the book that goes with them. I love the variety of fabrics that you get with a later cake. Instant coordination of fabric is what I like best as well as being to cut less and sew faster! I love the variety of fabrics in layer cakes. Not only are they coordinated but there are so many of them! Love layer cakes-squares are big so lots of options of how to use them. Coordinating fabrics is nice as well. And, I like Jackie’s comment above-they are very easy to store. Have many but can never have too many. Thanks for give away opportunity. I lover layer cakes because the fabrics all coordinate. 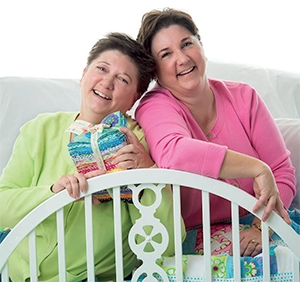 I love Barb and Mary’s fabrics – they are always so bright and perky. Making a quilt with their fabrics is such a delight because the end result makes the quilt recipient happy. As I am losing my eyesight, lost sight in right eye and the left isn’t too great, I want to continue to quilt as long as possible. Layer cakes enable me to have coordinated fabrics without having to struggle to see if fabrics go well together. Also less cutting. And quick quilts. Win win all the way. I love the coordination of the fabrics! Makes the design job easier and also, if I need to add additional fabrics, then the colorway of the layer cake helps me pick coordinated fabrics that will work with the layer cake. They are great!!!! Love the color/pattern coordination of layer cakes and how versatile they are. I love love love layer cakes! You get a taste of a fabric line without the investment of purchasing more yardage. Versatility is also a factor because if you need 4 charm packs, just cut a layer cake into four and it’s more economical. In a layer cake, you can’t beat the variety of the fabrics, and it gives you a great head start. I love, love, love the Sisters’ lines of fabric. They are so much fun. I love the coordination of dye-lots in layer cakes, and the patterns from cheery to formal are irresistible. I love layer cakes. Complete, coordinating fabric line and an easily used size. Instant coordination—fabric selection is so much easier, and I don’t have to have anything cut! Coordinated, many options on what to do with them because of larger size and yes easy to store. I do like the variety of fabrics, easy to stash and less cutting when starting a project. I like layer cakes because they are so versatile. You can use patterns designed specifically for them, or cut them in 5″ squares and use patterns for charm packs, or cut them in 2-1/2″ strips and use patterns for jelly rolls. Or you can go even smaller and cut them into 2 inch strips or squares. All with very little waste. I’m getting into more quilting and these layer cakes would streamline the process while adding such fun due to their cute patterned prints. I’ve never tried a layer cake so it would be exciting to win one along with the book. Instant coordination is the advantage of layer cakes. If one does not have the time to shop for the perfect coordinating fabric this is the way to get going on making a quilt. I love that layer cakes are all color coordinated and that they give a wonderful variety. Top that off with the bonus of less cutting time can’t ask for anything more. I love the easy coordination of layer cakes. It’s fun to have a variety of fabrics in the same size to build from. The easy coordination of the fabrics. I guess I would say the coordinated fabrics. I haven’t used my layer cakes. I would love to win this giveaway! Instant coordination. For a quick gift quilt, I love that I can pick up a layer cake that matches the recipients taste, which could be very different than what I have in my stash. I love the coordination of fabrics. Sounds strange, but I like cutting fabric. It’s so calming. I’m really not a pre-cut fan. I find choosing fabrics and rotary cutting what I need for a project to be very satisfying. But those two books look terrific and the fabric collection is cute, so I’d be very happy to have them. I love layer cakes for a number of reasons. The prints are already cut and coordinated with each other. If you are in need of a quick quilt, the 10 inch squares sew together really quickly and you can have a completed quilt in no time at all. Each piece of fabric is just gorgeous all on its own. They can be cut into smaller pieces and mixed with coordinated solids to create additional projects. Layer cakes are my favorite pre-cut. part the best, but the instant fabric coordination is great, too! I LOVE the fabric coordination & getting all the fabs in a collection.Quilt shops seem to order in only certain fabs of a group when we would like to see all of them. So we see them all in a layer cake & can find the ones we like so we can order fab for a certain quilt pattern. I am a fan of layer cakes . I collect them for scrap quilts and also use them to make a quick quilt for a gift. I do like sewing with the variety found in a fabric collection. I will look into these books. They sound like the perfect gift for my beginning quilter friend, as well as to add to my collection. I am addicted to pre-cuts and layer cakes are just irresistible to me! I love that the fabrics are already blended and all I have to do is decide how to cut them up and put them together. Mainly I love the fabric coordination!! Easier to work with than yardage, much easier to purchase! Very addicting!!! Layer cakes are just so pretty, and the possibilities are endless for pretty quilts! I love the all ready coordinated fabrics and a great head start on a quilt to give away. I have not had the opportunity to use a layer cake yet due to the cost,but I love the variety they offer while still being coordinated. I love the Frolic line and layer cakes , they are so versatile the colors are already coordinated for me and the sewing options are endless. You get a lot of variety and very little waste with a layer cake. So quick and easy to sew! My favorite thing about layer cakes is the fact that you can see so many coordinating fabrics from a collection all at once! They’re also a very versatile ‘pre-cut’ choice as I’ve sub-cut them into 5” squares for a number of quilts. I am a big fan of half square triangles and I love using cheater methods with layer cake squares. Makes everything sew easy! The coordinated variety of prints saves so much shopping time! Love layer cakes! I love layer cakes as they have lots of prints that go together and if I want to make a wedding ring, they are the perfect size, a trip around the world, just make 2 cuts and you have a 2 1/2 " square, saves a lot of time. The size is good to work with and being color coordinated is a big plus. I love that I don’t have to search for fabrics the go together. I can just sit and sew. So easy to coordinate. I have some and can’t wait to start. I use layer cake pre cuts. They make fast and easy quilts of coordinating fabric. They can be cut into smaller pieces as I also like charm packs. I love Me & My Sister fabrics and have purchased many over the years. Love how they are always bright happy colors. I don’t have a layer cake but they look yummy. Instant co-ordination of fabrics makes layer cakes so easy to use. I have purchased a layer cake occasionally and I like the larger precut and the coordination of the fabric. The book has some fun ideas to use these precuts. Love that perfect color combinations and fabrics with varied scale are already picked for me! •	Instant coordination—fabric selection is so much easier. •	Less cutting, more sewing. they are easy to store and a quilt goes to together quicker. I love the Me and My Sister fabrics! I like layer cakes as they are so easy to work with and ready to sew in so many different ways. I just used my Accuquilt Big Electric to cut up several banker’s boxes of fabric into many shapes to use for charity quilts. One shape was the layer cake size and I’d love to have these books. My results, however, would be extremely scrappy so would probably not look anything like what’s in the pictures in this article. However, the patterns would certainly be a great help. I love that the layer cakes give me the entire fabric line and is large enough to see the beauty of the fabric. Love Layer Cakes because of the variety of their use in various quilts!! They make things simple and easy when cutting to get a quilt together. With a Layer Cake you get a sampling of all the fabrics in a fabric line. They have become a go to for me when needing to make a quilt in a short time frame. I have only made one quilt using a layer cake, it was all HSTs. I like layer cakes because all the fabrics blend together, that is the hardest part for me is picking fabric colors. Your books have more than just HSTs to make quilts which looks fun to do. I love layer cakes because of they give me a coordinated group of fabrics that can be used by cutting them into many different sizes. Fabric selection is one of my favorite parts of quilt-making, so I rarely buy any type of pre-cuts. That said, layer cakes are a great overview of a collection, especially larger prints, and a good way to stretch design muscles if trying to use just the layer cake pack with perhaps one added blender. Thank you for continued inspiration. I don’t have many layer cakes, but I like that the fabric is all coordinated! It would be great to win this book as not all patterns adapt to layer cakes. I love the coordination and variation of fabric without a big investment. I absolutely love layer cakes variety of patterns and colors. Everything coordinates so well. I keep buying and buying them but haven’t known quite how to use them. I definitely need books on what to make using my layer cakes! I have never tried a layer cake but would love to try one. They sure do look yummy! Love layer cakes! Definitely the coordination of colour but I always throw in “ bits and bobs”of other collections. Plus they are speedy and you get a big enough quilt to snuggle under! Thanks for the chance to win! I don’t have a layer cake yet but like the fact that they color co-ordinate and are great for small or even medium size projects as you can buy more than one to make whatever size you need and also very, very handy for applique! I love the less cutting and the coordinating is all done and it save so much time for me. The best thing to me about layer cakes is that the fabric is all coordinated for me already. It makes sewing so much less time consuming and fun. I like the less cutting and more sewing — plus the 10″ squares are easier to handle than larger widths of fabric. I like layer cakes because the filling and the frosting adds so mucch interest to …oh wait, you mean fabric? Those lucious, beautifully coordinated stacks of non-fattening treats-for-the-eye? Love `em… don’t have to stress out on fabric selection. The only stress is which layer cake to buy and what pattern to make. Oh yes and "Quilt as desired." Layer cakes are great – when time is limited at a shop, selection of fabric is so much quicker and easier! I love that you can get a variety of fabrics, all coordinated, without having to buy lots of excess yardage. I love Layer Cakes because of the coordinated fabrics. Within each layer cake the fabrics are light and dark, calming and busy. But they all work together in a quilt. I have a stack of layer cakes and would love the opportunity to win this book. New ideas welcome!! I LOVE layer cakes because they let me have very versatile cut of every fabric in a collection… it is my go-to precut … a great way to sample everything in a fabric line! Used them once for a children quilt class but haven’t since. I love working with layer cakes and other precuts. The time is literally cut in half! Plus you get all the different colors in one pkg! I like getting the different fabrics all together. I LOVE layer cakes!!!! You can do tons of things with them. They’re so versatile. You can mix and match with other lines. You can cut them into perfect log cabins. You can make 4 sets of 5” charms, they can be background for appliqué. They are my Go To precut. I have loads of them. I can’t resist them! I love the fact that Layer Cakes are color coordinated. I’m not confident enough, yet, in my own coordinating. I love having every fabric in the collection!! I have many layer cakes. It is fast and easy to make a quick quilt for a wedding or new baby, etc. The colors are beautifully coordinated which makes a wonderful quilt. I bought a layer cake because of the coordinating specialty fabrics, but am delighted that I also get less cutting with my project – especially less cutting of large pieces of fabric. Layer cakes are also more economical if you like the fabrics in the cake and also save lots of time. I have never had a layer cake but the thought that all the material is coordinated and I would have less cutting to do is very appealing. I would love this book, Yummy…..
layer cakes let me try a fabric line that I might not otherwise would have. Also within the line it helps me add a piece of fabric that I might not have added- they make me stretch!! I love that!! I love the fact that a layer cake is an instant headstart on my projects! Beautiful fabrics already co-ordinated and precut. Usually just a few more simple cuts and ready to sew. Less cutting, easy fabric coordination. What’s not to love! I love that I have all the variety in the layer cake. I can use some of my scrap quilt patterns with layer cakes also. Love them. I don’t usually use layer cakes, but I love these books. I would be thrilled to win. I love that fabrics coordinate, so I can dive right in, and with less cutting, get sewing! I love the instant coordination of a layer cake, as well as less cutting. Usually when I’m very excited to make something, I don’t have to spend to much time cutting fabric before I can start sewing. My favorite is the color coordination–then the ease of (no) cutting. I really enjoy these two designers! I love having the fabrics already chosen for a quick quilt. It lets me think less to sew more. Layer cakes are sew easy to cut, more time for sewing! I love it all, esp the featured designers – love their colors! Less cutting, more sewing, cute quilts in these books! Thank you for the chance to win. You can make so many beautiful designs from them. I love all the fabrics coordinate since I’m so challenged when it comes to this part of quilting. It’s pretty east to put a quilt together when most of the cutting is done. I love layer cakes for all the listed reasons and if you have the right pattern and template you can make quilt blocks with little if any fabric waste. I love having the colors picked for me that coordinate well with each other!! Had heard the term ‘Layer cake’ but never knew what to expect. But these quilts look sóóó pretty, it’s time to start working with layer-cakes. I love that there’s less cutting involved so I can get right to the fun part—sewing!!! I love them for all the reasons that have been posted!! I thought I was too fussy to use precuts, but have come to love them 🙂 The books look yummy, too. I have a few cakes, but can’t decide on a pattern. This would help. I love layer cakes because I get a smattering of every fabric in the line; enough to make something special! I love layer cakes. The fabrics are a wonderful combination of colors, values, and I am ready to start. I’ve never tried a layer cake but love the idea! I like layer cakes and charm squares for a quick way to add variety to my stash. I’m a scrap quilter, so the more the merrier! I haven’t worked with Layer Cakes, but this book gets me excited to do so. I love the fact they are so versatile – you can make anything from them! Plus, you get a piece of the whole collection! Love the coordinating colors and ease of cutting. Love precuts in any size. This fabric line is full of beautiful colors to mix and match. Working with layer cakes are great and helps make an easy start to any project. The fabrics cordinate so what is left is deciding the pattern. I’ve just bought my first layer cake and I can’t wait to get started! Layer cakes are great because you can create so many different size pieces using them. And the fabrics always coordinate! I am a fan of less cutting and more sewing. The large squares of fabric make it easy to get started and offer more options than smaller cuts. The bright and cheery colors in this collection are appealing. I love that someone has chosen beautifully coordinated fabrics and I don’t have to go all over searching. Oh I love the colors in the layer cakes and how they all coordinate. I have been collecting them for a few years and I think I need to start making beautiful quilts with them like those Barbara and Mary are showing. I would love their books! I like the fact that I don’t have to color coordinate. It’s done for me! I don’t have a lot of confidence to put fabrics together, so a layer cake does that for me! I love them! Pre cuts are such a time saver! They are not only cut to size (or nearly) they are all beautifully coordinated, too!!! I just love your pattern around the block…I’m going to be a new great grandma so this would be a beautiful gift to welcome a precious new family member! I LOVE layer cakes! I appreciate the variety of coordinating prints. They are quite economical when you consider the cost of buying yardage or fat quarters to provide the same amount of variety. I also appreciate the time savings on cutting! I love that the fabrics are already all coordinated. Plus I get a sample of each fabric in the line! I like getting all the fabrics in a good size for lots of options. i love having an entire collection in a small package. the first time i made a layer cake quilt i was amazed at how fast it went together. I am terrible at selecting fabrics! Layer cakes take all the guesswork out of the process. And with so many layer cakes available, I can always find one to suit my project. I like that the fabrics are coordinated and have 5 layer cakes untouched. Waiting for patterns that have cutting directions specific for layer cakes. I am 70 years young. I have had lots of fabric and scraps to use. I love the idea of layer cakes! They perfectly match and not much scraps left over. I don’t have to shop for cloth to match, in several shops. I can just leisurely cut my pieces and start sewing right away. Nowadays I just shop for fabric that I think looks nice as backgrounds. And pick out a few pre-cuts! I would love to win!!!! I love layer cakes because they are all coordinated and usually have a great variety of pattern in the fabric. Layer cakes are nice because they contain a variety of color coordinated fabrics ready for a project. I like that the fabrics are color coordinated, yet make a great scrap quilt. I love these layer cakes because they are gluten free. I love your colors. I love layer cakes, less cutting, fabrics all coordinate. Love them when you need a quick quilt put together and they look beautiful. Like the fact that they are all color co- ordinated and I am color stymied. Plus patterns are easy to follow. I love the coordination in layer cakes. In fact, I have…a bunch of them. My problem is deciding on a pattern and actually cutting into them! I love having a piece of the entire collection of fabric to work with. Love seeing all the pretty prints together! I love layer cakes because they are already color coordinated and they’re easy to use. I love them all! I love the Sisters’ patterns! I’ve made many in their 12 Pack Fat Quarter book and had to get it spiral bound because I use it so much! I have a lot of layer cakes, but don’t use them that often – I think I will need to try one of these layer cake books! First, I love these sisters! I first saw them with Jenny Doan on a tutorial on MSQC, and it looked like they were having fun! I love all precuts as, like most comments here they are coordinating fabrics. I order many just because they’re the deal of the day and they’re so pretty! Will order both of these books so I can use some of the layer cakes in my stash. It’d be nice to win, but if not I will order each one at a time. I’ve only made one so far. It was so quick and easy. I love the accuracy too! I love not having to pick colors that match. Everything in the Layer Cake always goes together. I love that you get a piece of each of the line. They take the work out of the project and you get right to the meat! These books are fabulous. I would have to say the color coordination. I have only bought one layer cake and haven’t done anything with it yet, so I sure could use ideas on what to do!! I love that layer cakes are cut,and that I can easily use them with my AccuQuilt. I love layer cakes, all the fabric coordinates and I don’t look at my quilt later and say "Hmmm, that one fabric doesn’t quite go with the others". My main problem with a layer cake is I have a hard time cutting it up, it’s too pretty. The thing I like best about layer cakes is that the fabrics are all coordinated so I don’t have to stress about choosing fabrics. The next thing I like is less cutting and more sewing. The quilts featured are beautiful, and I’m always amazed at the designs that can be created with a pre cut. Haven’t used a layer cake yet; it’s tempting! I love the instant coordination ! I LOVE layer cakes because of the color coordination is already done for me. I have the hardest time doing that. I know what colors I like, but getting that coordination of those colors seems so hard for me. Thank goodness for layer cakes!! I don’t have a layer cake yet, but they look yummy. I love the fact that they are color coordinated. Instant coordination–I’m no good at picking coordinating fabrics. Love the colors and that they are all coordinated. I love that all the fabrics are coordinated. I’ve made several quilts from layer cakes and enjoy them all. Less cutting – more sewing of course! These look like nice fresh designs too! Layer cakes offer so many possibilities! Less cutting and more sewing pluss they all go together. Less cutting to get to the sewing, but I also like having the variety of the whole collection. love the instant coordination in small amounts. Helps with stash control. When I have a layer cake, I don’t have to decide which fabrics I want to buy from the line… I get them all!! I have a few that I really should use, so these books would help me get started. I like the coordination factor, but I also think the size makes for very flexible use in many patterns. I definitely love the instant coordination of a layer cake. Fabric selection is so much easier and I can get started on my quilt right away. Plus there are so many patterns available specifically for layer cakes. Would love to win this book and fabric by Me and My Sister. I haven’t worked with a layer cake yet but it looks very intriguing! I like the coordination. Plus the size is large enough that you can use them for EPP, applique as well as piecing! I love the instant coordination! Layer cakes are so colorful and have a bigger variety of fabrics than I sometimes buy for a quilt. What cute quilts this book has in it! I would love to make any of those as they are all striking quilts! I think all of the above. There is more versatility in layer cakes than charms. I have a few and this book would prod me to start using them. I love the less cutting, more sewing first followed closely by the already coordinated fabric! What I love about layer cakes: The colors catch my eyes first. I love seeing what goes with what. That may be enough to get me to buy it even if I don’t have a pattern in mind yet. Your books will help with that. :-). Also the fact that you can substitute one in for charm packs if the website has run out of them. I believe another quilter mentions that too. Yes, with pre cuts you can get to sewing faster. That is always a plus! Color, pattern, inspiration for sewing, your giveaway has it all. I have not done one yet but am anxious to try it out. I love the fact that all the fabrics go together. I love the versatility. I get a lot of pieces of fabrics, all coordinated, that can be cut into a variety of sizes, or not. Less cutting! They are great when you need a quick and fun quilt. I’ve fallen in love with layer cakes (and charm packs!) because of the easy coordination and ease of fewer cuts. I don’t have a Layer Cake yet, but they sure look yummy, especially Barb and Mary’s! I love the size, as you can make both layer cake and charm patterns from them, and love having the whole group of fabrics to work with. And I love these ladies–their fabrics are so cheery, and their patterns are great! I love the idea of having a little bit of fabric from the whole line! And a quick quilt to put together…..who doesn’t love that!!! I absolutely love the LESS CUTTING value of a layer cake. There are sewwww many patterns with minimal cutting of a layer cake it’s soo inspiring. I can’t tell you how many layer cake quilts I’ve made. Would love to have one of these books. I love that it is a bigger piece of fabric, makes it more versatile. I love layer cuts. So much to work with! I love knowing that the colors are all going to coordinate. What a great time saver! Instant fabric/color coordination, so easy to just start cutting when inspiration strikes. What I love about a Layer Cake is that you can use as is or cut into so many different combinations that yo can’t do with smaller pieces. It’s endless mine thinking. Hope to win a book and fabric. I only have one and I got it because of the coordinated fabric. I love layer cakes for the coordinated fabrics! It saves so much time, especially for a baby or small quilt! Especially when time is of the essence, a layer cake is perfect! I recently fell in love with layer cakes. I purchased one last summer and made a beautiful Batik quilt. It is my favourite precursor because it is so versatile. Would love to win these wonderful books and fabric? Layer cakes are great because the fabric is already cut for you but still big enough that you can subcut them into all kinds of different blocks and shapes, and you get just a little bit of a large range of fabrics for a nice scrappy look. They’re great for making charity quilts too. I love that you get to work with a designer’s full line of fabric without having to buy 42 separate pieces of yardage, especially since most retailers won’t carry evert piece of a designer’s line. If you want yardage of a particular print you can likely find it for sashing or borders. Love layer cakes because the are color coordinated and you can cut them down for other precuts! So many things you can make with them! I love precuts but layer cakes in particular because they are all coordinated for me and with about 3 yards in a package one is usually all the fabric I need. I love instant coordination…no guessing if the fabrics go together. Done! They are a great time saver! Helps lessen the strain on arthritic hands and you get all the fabrics in the collection. I love layer cakes!! Less cutting , more sewing! Less cutting, more sewing. Due to a back injury, I have a hard time standing at my cutting table for long periods of time, so pre-cuts are wonderful. Layer cakes are my absolute favorite! I like less cutting, more sewing. Which also means less fabric folding and less putting fabric back in stash. I love layer cakes for so many projects. Of course and charm or layer cake quilt is easy, but they are great sized for applique pieces as ell. Instant coordination—fabric selection is so much easier. Before layer cakes, quilters were required to spend large amounts of time choosing fabric that we hoped would coordinate! You can do a lot with a layer cake! There are a lot of possibilities. I love them! I really like having all the fabrics coordinate, making them a very versatile pre-cut. I love the coordination and that they are so versatile! Love, love , love layers cakes. Coordinating the fabrics are already done for you. I don’t have any layer cakeso but the colors! Such beautiful colors! I love that they’re instantly coordinated and precut to boot! I love the no-stress color coordination! Thanks for the chance to win! Hi,I like "Less cutting, more sewing!" Thanks for sharing a pretty giveaway! less cutting, more sewing. I have only used a layer cake once but the patterns look easy to do. I love the variety of prints & that they are all coordinated! Makes getting ready to sew a lot easier! Instant coordination! I have 1 set and I can’t bear to cut it up! I don’t have a layer cake yet. I think I could learn to love precuts !! They are versatile and coordinated. I like layer cakes as the colours are co-ordinated and can easily be cut into a beautiful quilts. I love that all the fabric coordinates! The time saved for cutting is a plus too! I love layer cakes as they save so much time in getting ready to piece a quilt. Just a few quick cuts and you are at the machine sewing a quilt top. Also, the colors all coordinate again saving time. Instant fabric coordination and less cutting and more sewing! Layer cakes are great and the books look wonderful too! Layer cakes make my piecing life easier and filled with scrappy variety! Less cutting, more sewing! To have a book of patterns based on these coordinated pieces would be a dream. I have a layer cake of children’s prints on my shelf, waiting for a pattern, so that they can go to the pediatric ward and cheer up a child and her family. I have over 50 later cakes waiting to be turned into a great quilt! These books just might be my solution. I love Barb and Mary! I love that I can build color confidence using layer cakes because it gives me new ideas on what can go together!! I love Me and My Sister designs; their color palette makes me happy! I have just recently really gotten into using layer cakes though I’ve had several for a long time! LOVE them! I like the less cutting feature the most, and the fact that all the pieces automatically coordinate and I get to choose my favorites. I just finished a granny square quilt cutting them into 5″ squares. Now my project is the Moda Love quilt, I decided to do the layer cake version first! So much fun!! This is a fabulous giveaway!! I love the instant coordination. I am terrible at picking fabrics that go together. Thanks for the opportunity to win! Well, they have the word "Cake" in them. I like them for ease and fewer leftovers when you are cutting for a quilt. They give you a great variety for your quilts. Those two quilt books look very nice. I love how the fabrics Co-ordinate and the ease of cutting the layer cakes into different quilts. Instant coordination for sure!! I love that I get each and every fabric from the collection – LOVE! I love the coordination of the fabrics. I love the concept of a variety of fabrics packaged in a convenient bundle. I love the pre-cut ease of the cutting work done already. And I love that designers have come out with so many patterns to make it fun and simplified to make up a quilt. I guess I just love layer cakes period!! What I love most are the coordinating colors and the number of them I get to play around with…. I love the coordination – that you get all the fabrics in the collection! And there are so many patterns that use layer cakes! I have over 50 layer cakes waiting to be turned into a great quilt! I really like having a coordinated color pallet and having a slice of every selection in that line. These books just might be my solution. I love Barb and Mary! Less cutting, more sewing! Who doesn’t love that? I don’t have a Layer Cake yet, but they sure look yummy! I like the idea of instant coordination. I have never used a layer cake but would like to try. Jelly rolls are great so I know layer cakes would fun to use. I love the instant variety of fabrics that all coordinate together. I will say though, they sure are hard to open up and use. Everything is coordinated and ready to go. hanks for the chance to win some awesome prizes! I spent yesterday cutting over 2,000 2 1/2″ squares. Precut sounds pretty appealing right now. I don’t have a layer cake yet but they sure look yummy. I like them because they are large enough to use in various ways, and the fabric selection will give a guaranteed good look. I love the colors that are so well coordinated and I can get right to the sewing. This book looks great. Have done one layer cake and like that a lot of the work is done for you, color selection, cutting, shortens time, what’s not to like. Would love to have another project! Quick and matched. Sometimes that works well! I really love working with Layer Cakes, they are soooooo versatile! I’ve made several quilts using them and plan on doing several more. They are so easy to use and a great timesaver. All the fabrics blend beautifully and when I buy them I buy 2 matching fabrics at 2 yards each, then you have borders and bindings. Love, love, love them! I like the instant coordination. I get to see all of the fabrics in a collection. I really like the Suburban quilt and the quilt motifs that were added! I like layer cakes for their versatility. You can cut them & use them as charm squares or use them in so many different patterns. I think a couple of my granddaughters would love that fabric & it would be fun to make them a quilt out of this book. I have always loved bright colors and the Layer Cake Prints are fabulous. They come in several degree of color and prints which are fantastic. I love layer cakes because they are so easy to use and very versatile. You can make 2 1/2″ strips, 5″ charms or use them as they are and make pinwheel blocks. Sometimes it is very hard to cut into them because they are so pretty and coordinated so well. I luv that 10″ squares are instant coordination (fabric selection is so much easier) and of course there is less cutting so there’s more time for sewing! Thank you for this chance to win this awesome prize. I haven’t use many layer cakes but these layer cakes coordinating fabric. A breath of spring here in the northeast. The patterns books make me want to get some and make a quilt or 2. A layer cake offers a big variety in a size that I can use without overflowing my scrap bins by buying 1/4 or 1/3 yards. I don’t have a layer cake yet. They look so easy to use and fabrics look so pretty. Would love to try them. I love all the versatility and coordinating fabrics of layer cakes. Love layer cakes. They can make piecing quick and easy and so many ways to cut and assemble blocks from them. I like that there are so many ways to use them, and so many colors and prints. I love layer Cakes, as you purchase a whole line of beautiful fabrics. Which can be more affordable and easier for me to pick fabric, then separately Off the bolt. I’d love to experiment with a layer cake, but I don’t have a Layer Cake yet, but they sure look yummy! The size looks more practical to use than smaller precuts. Love that the talented team has created so many wonderful patterns. Having a beautiful, coordinated mix of fabrics without having to buy small yardages is the best part of layer cakes. The consistent 10″ cut size helps me with planning. Instant coordination…a leap up to more! Love that I finally discovered them. Love that you get to own so much of the fabric range. Love the scrappiness. Yay! Love the concept of having coordinating fabrics all together! Gives me ideas and the courage to put different colors and patterns together and they look great! I love layer cakes because they are all coordinated for me. They are the right size. They look cute on a shelf and so many other reasons. I need to find the books to use some of the cakes that I have collected. I like them because all of my fabric choices have been made and I have the whole line in one package (or two or three or four). Definitely less cutting, more sewing. The fabric combinations all together saves time! Mostly I buy laker cakes because you can do so much with precuts then, there is the color coordination, so easy. It takes less time finding coordinating fabrics when you use layer cakes. There are many books out there with patterns for quick and easy patterns. My UFO’s are less happening when I use layer cakes. Yeah. I don’t have a layer cake yet, generally buy yardage. I don’t have a layer cake yet but I love be the color coordination. A layer cake is instant inspiration. Having large cuts from a collection assures me that the look will be cohesive while giving me so many options. Love the color coordinated and varied fabrics in a layer cake!!! I like having a group of fabrics that go well together, and the size makes it perfect for piecing a smaller quilt. I like layer cakes because I can use them as is, cut them into 5″ squares and/or 2 1/2 " squares, the combinations are endless and they are all coordinated for us. How easy is that? And the books are terrific. Thanks so much! Love layer cakes because you get such a variety of coordinated fabrics in a very usable size. Would love to win the book and layer cake pkt. I love two of those quilts and would like to make them. Precuts are the best! Colors are already chosen! Layer cakes have already put together the coordinating colors and patterns for you so it’s so much easier than choosing fabrics on your own. See the problem is, I don’t know what to do with a Layer Cake. I was gifted with one this Christmas, but I’m not sure how to use it. Thanks for the great giveaway. It looks like these books have great patterns. I love layer cakes because I have a piece of every fabric in a collection and it is a perfect size!! I love the size of the layer cakes and the color coordination of how perfect they blend together! I like layer cakes as a way to sample a fabric collection. I can make a few blocks to see how they go together and see which blocks work best for the fabric designs and colors. This helps me choose which fabrics to buy in yardage and also in determining a quilt pattern. Love layer cakes! It gives me a lot of variety in fabric choices and let’s me make easy cuts for several sizes. I love the variety of choices without needing to purchase a lot of fabric. Makes scrap quilting easy without a lot of scraps. Less cutting, more sewing and the scrappiness of them. I have never used a layer cake. I am used to using the 5″ squares but the idea of larger, color coordinated squares sounds appealing. It might mean I could do more quilting because a handicap keeps me at minimal time quilting. I love that the fabric coordinating has already been taken care of. I think picking out the fabric for a project is the hardest part! I love layer cakes because you get a "taste" of all of the fabrics in each collection. And they’re always sooooo pretty! I have never used a layer cake but would love to. Your books and fabric look like fun projects! I love the thought of the whole fabric line being there. No muss no fuss. What’s not to love? Love that the fabrics are all coordinated! Love Me and My Sister-thanks for the chance to win these great prizes!! Layer cakes are the perfect size to increase your stash without taking up too much room. I have never used a layer cake but have been tempted to buy them. I really didn’t know what to do with them but your book shows some great examples. I don’t have a layer cake yet! I just got used to jelly-rolls!!! I have never purchased or used a layer cake…but I would love to win this giveaway so I can try it out! I love the way you get so many different prints without having a lot of leftovers. I love using layer cakes as they all coordinate beautifully. That saves time from selecting fabrics that coordinate in my stash or having to purchase fill in fabrics. Thanks for this giveaway! Using layer cakes saves cutting time and the fabrics are already coordinated! Love them. They are the perfect amount of fabric. Definitely less cutting and more sewing! I find it difficult to choose a pattern for a layer cake–maybe this book will help! 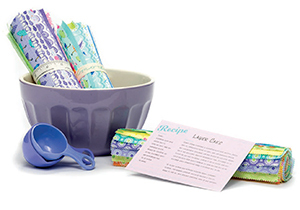 Love the variety – a taste of a whole line and ready to sew. I love layer cakes. They give me fabric fron the entire coordinated line . If I think I might need more of one design, I buy yardage , for borders or background. I can make fast easy quilts. I donate a quilt a month to my church and I am making a Christmas quilt for each household in my family so that means 12 Christmas quilts with at least 5 are being made from layercakes. I love layer cakes, instant coordination. I’m working with a set right now. Less cutting is always fantastic. I love having the whole range of fabrics, too. I love that the layer cake includes a piece of each fabric in a designer’s given line. All coordinated and ready to go! Love how everything coordinates, makes life so much easier. Fun to work with. I love Layer Cakes. I love that they are coordinated and often have the fabrics from a whole designer line. Thanks for the giveaway. I love layer cakes because they allow me to make a large quilt fast and show show off the gorgeous prints! Everything coordinates and there are several easy cutting options – more than with a charm pack. I really like layer cakes but especially the mix of colors from a line of fabrics. Instant coordination is immeasurably valuable to me. When I started buying fabrics for my first "original" quilt design, I quickly realized that I did not yet have the skills to co-ordinate as many different fabrics as I needed to use. Years later, that project is still in a project box, waiting…. I LOVE the fact that pre-cuts come already co-ordinated! I love how versatile layer cakes are. I can cut them into 5″ charm squares, or 2-1/2″ strips and squares. There are many nice patterns for Layer cakes! I like most precuts but layer cakes and strips seem to be the most useful. You can make a lot of kids quilts with them, the colors are already go togethers and I love the bright cheery colors from Me and my Sister. I also love all that cutting I don’t have to do. I do not have any layer cakes. But they do look yummy. I love the blends of fabrics in layer cakes. There’s always some fabrics that I never would have thought to add to the stack but coordinate beautifully and add an element of suprise to the stack. What I like about layer cakes is making a quilt without a lot of scraps left. There are many nice patterns for precuts! Yes, instant coordination, and lest cutting more sewing! Also getting a large selection of that group of fabric collection. I love layer cakes! I used a layer cake for the first time for a Christmas quilt. It makes it SO QUICK & EASY!!!! Can’t wait to do another! The not-having-to-choose aspect of any pre-cuts is the appeal for me!! I take forrrevvvvverrrrrrr to choose from my stash! Thx for the chance to win! I love that the fabric is coordinated and there is less cutting when using the pre-cuts. Makes a project go faster!! I love working with layer cakes. They are all match and are already cut in some cases. If not, they’re easy to cut into whatever you need. A layer cake has SO much variety, yet at the same time it’s coordinated. Plus it’s such a great size that can be sub-cut into more useful sizes. I love layer cakes because you get all of the fabrics in a line where the quilt shop might only stock a few. Maybe they don’t have your favorite blender! Cutting is easier because you know you are starting with 10×10 and go from there. Easier to handle than larger pieces of fabric. I love the 10 inch size…large enough for endless possibilities. I haven’t tried a layer cake yet, but after seeing those fabulous colors, I am definitely going to try it. Soooo beautiful!! I think it is a little of both "Instant coordination—fabric selection is so much easier" and "Less cutting, more sewing". I have several waiting for me to find time to sew. To be honest Layer cakes mean Im more likely to have regular and right cut pieces! Im limited on laying fabric out space to cut ………well that’s the excuse I use for cuts as straight as a donkeys back leg!! Just starting to collect a “stash” and it seems layers cakes are a good thing to have, as they can be cut in several different ways.. I like the fact that I can get a whole collection of coordinating fabrics but not spend a lot of $$ for them. I like the instant coordination of a layer cake. I find picking fabrics from different lines a little difficult. I just bought my first layer cake for the coordinating colors, I seem to struggle with getting the right colors together. I have checked online for some ideas but not sure how to cut them to get the right angle(s). The books would be a great asset to my collection. I am always lookin for something new to make me step outside of my box. It seems I am always making baby quilts, husband has a large family and I am making 4 quilts for the new little ones to be born this year. I have never used layer cakes, but would love to try. I love pre-cuts…they save time and make life easier when sewing. I only make scrap quilts. The layer cakes are coordinated scrap quilts. Lots of projects so little time. Layer cakes are so versatile – can be used as a 10″ square, can slice into 5 x 10″ strips or 4 charm squares. All the fabrics coordinate which means it a "no brainer" to use – no thinking required. Frolic is such fun looking fabric. I like that all the fabrics are coordinated so everything looks very put together. Love the coordination AND less cutting more sewing! Fulfills my "organized chaos" scrappy look quilting I love! I like the fact that it gives you a "bigger taste" of a fabric collection than just a charm pack…lots of patterns for layer cakes….but if you want to use charm packs for a certain pattern, you can cut them into quarters, and voila! instantly four charm packs. I like the variety of coordinated fabrics! I love having a piece of each fabric in the collection! I love that in one package, all wrapped up, you will find such a variety of prints and/or colors, it is like opening multiple presents! Instant coordination. Often helps me to see the possibilities that push my boundaries. Layer cakes are great to work with. No quests work about coordination and easy to handle. Having a book with patterns is a plus. These authors know their stuff. I love the variety. One stop shopping for great coordinates. I don’t have one yet, but they look great! I like all sizes of pre-cuts, but they all have their limitations as well. Layer cake squares are nice for designs with larger components, without waste from purchasing extra fabric. Not only coordination is done with layer cakes, but the collections are usually not available in my area and I also love the flexibility of being able to accurately sub cut to other shapes needed. I love layer cakes, really precuts of all types for the convenience. Sometimes I just need to pull a quilt together quickly or take a break from a detailed quilt I’m working on and can go to my stash of precuts and I"m on my way in no time. It has to be the instant coordination – I love to blend fabrics, but where in your stash can you find potentially 40 different perfect fabrics??? Less cutting, more sewing. Cutting isn’t my favorite part of the process, and I am happy any time I can do less of it. I love Me and My Sister designs — so simple and their patterns are easy to understand and always accurate! Layer cakes are so helpful in co-ordinating colors and designs. Thanks for the giveaway. To be honest layer cakes are so affordable. You can get the whole line of fabric you love, from the designers you love, without breaking the bank!! When you need a quick quilt for a gift, you have it all at your finger tips!! The fabric and the easy quilt patterns!! How cool is that? It’s the instant fabric coordination for me. The quilts in both these books are relatively simple to make ( but look complicated) and the bright, coordinated fabrics add a cheerful look to however they are going to be used. the fabric design! I don’t have to purchase yardage. to do with them. I still buy them because they are so beautiful! Less cutting, more sewing…instant color coordination and you don’t have to buy yards of fabric or fat quarter bundles to get all of the fabrics that you fall in love with…it would be really easy to accumulate a whole room full of layer cakes! Love that I don’t have to pink the different fabrics. It is already thought out for me!!! I’m very anxious to use your book designs and quilt fabric. I’ve always loved how you both work and design so well! I loved meeting you at quilt markets! Wish I could still go, but, I’ve had an inury where I lost part of my brain. I’m slowly working on finishing all my “waiting” blocks, that are 3 yrs old. I finally quilted, a quilt, waiting for me, till I felt better, again. I was in hospital and brain clinic for 7 months! In 2016. Wow! Only 2 years ago. Thanks for the fun to enter, Barb and Mary!! I love the instant coordination. I love that the prints/colors all coordinate and I can just sit down to sew. I use Layer Cakes to do my ‘mindless’ stitching – when I just need to SEW. Layer cakes are my favorite pre-cut–big enough for whatever size pieces you need to cut! Layer cakes are so versatile. They can be cut into charm squares, 2.5 squares, or 2.5 strips. It is the instant coordination of layer cakes that appeal to me. And, boy!, does Frolic do that! The bright colours and lively prints really spoke to me. I want to make every quilt in the book. The fabrics are color coordinated—you save money not buying each individual fabric and having lots of leftovers. using the layer cake versus cutting out the background. Did see a nice I spy quilt done using a layer cake. I love the instant coordination! I like layer cakes because you have some of a whole line. Also they are fun to work with to make a quick quilt. Although I do own a couple charm packs, I haven’t been able to justify buying a layer cake since I have so much fabric already. Once I’ve emptied one of my many boxes, I will consider acquiring more pre-cuts. I definitely see the time savings potential and the reduction in my scrap bins. 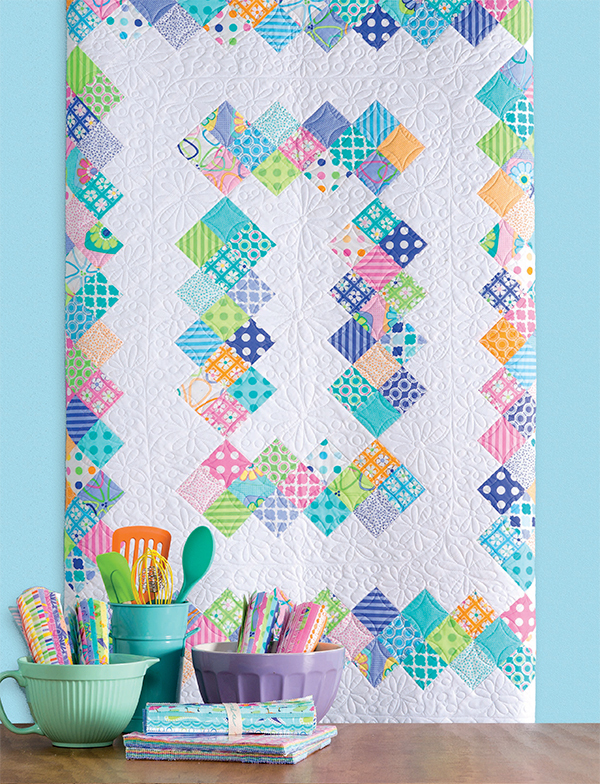 Coordination of colors and fabrics…many blocks to play with all make for fun quilting!!! Less time cutting, more sewing and ready to go. Less cutting and everything matches. Layer cakes = less cutting and more sewing! I love the fabrics in the "Me & My Sister" line! So colorful and cheerful! I love having the great variety of coordinates and the precut time saving. It’s so easy to put together a beautiful project in no time. Having coordinated fabric and quick and easy patterns takes a lot of the work out of quilting leaving you with all the fun! I love layer cakes because they are so versitle to use. You get coordinating fabrics in pieces that are big enough to make a nice size quilt and you are only limited by your imagination. Alll the work of picking out fabics is already done for you. Of course, a pattern can be really helpful. Same quilt using different layer cakes can look so very different. Instant coordination—fabric selection is so much easier. I love getting all the fabrics in a collection. Often I pick my favorites out of the bunch and buy yardage of those pieces. Layer cakes are a really easy way to get a quilt done when your time is limited. It eliminates the stress of picking fabric if that is a problem for you. I have not done a quilt from the designers, but would love to try some of their patterns. They always look so fun. Their fabric lines are so bright and cheerful. I love the versatility of layer cakes, instant coordination for sure! The best thing that has happened to quilting since mats and rotary cutters, are layer cakes. So great you can make a quilt from a pack of precut 10″ squares with a few yards of background! I love colorful quilts and buy and make lots of them from layer cakes. So fast to cut, turn and sew into a work of art! Better than fat quarters because you usually get the whole colorway. I love the easy coordination of a lune of fabric with layer cakes. Musc easuer also than cutting into yardage! I’m thrilled that a layer cake is color coordinated. It’s fun to look at the different fabrics in one collection. less cutting waste then larger pieces. I like the layer cakes because not only do you get fabric from most of the collection, but paired with a backgroound fabric you actually have enough fabric to make a nice size quilt. I love not having to coordinate fabric! The correct values are all figured for me! I don’t own any yet, but the patterns and concept are very appealing. I like that I do not have to coordinate a lot of fabrics so they work together. Oh, I just love collecting them! Kidding… love the way they are all coordinated for immediate use. You see the whole product line together. I love being able to get sewing right away with little or no preliminary cutting. I do like layer cakes! I like the instant color co-ordination and convenient size. Charm squares are often too small for me but the 10″ squares give me lots of cutting options. No, I have not yet bought Layer Cakes, but yes, they do look so yummy! All those cute colors and prints, and already cut in big squares that can be cut again into anything! I love it! What a fun way to spend more time sewing! Love the quilts shown here! I love precuts. I cannot coordinate fabrics for anything. So I need to go with…Instant coordination—fabric selection is so much easier. AAAAHHH!! The instant JOY of a PILE of coordinating fabrics! I love the coordination of an artist’s entire line— sometimes a shop doesn’t have all the pieces. In addition, the variety of quilts which can be made quickly is astounding! Layer cakes are my favorite precut of all. I enjoy having the entire collection of coordinating prints and the 10×10 size is perfect to capture the essence of each print. Absolutely love the sisters! This would be one giveaway that I would be overjoyed to win! Thanks! I love that the fabrics are all coordinated, something that I am learning how to do. Would love to try doing a layer cake quilt, but wasn’t sure how to do one. Fabric in layer cakes are so coordinated. Less cutting involved. I sure hope I win!!!! Less cutting. I have a great stash to use for big wonderful projects. But sometimes I want to work a little faster, particularly for gifted quilts projects. Or to try a new technique or blocks. I like layer cakes because of their flexibility. With minimal cutting one can have 2 5×10 inch rectangles, 4 2.5×10 inch rectangles or 4 charms with no waste. Also one can cut 4 3×7 rectangles with only a bit of waste. What’s not too like! I love easy color coordination with layer cakes and that way can get quilting sooner!! I love the coordinated colors of the layer cakes! I like that cutting time is less. Thanks for the opportunity. I love having lots of variety without adding large amounts of yardage to my stash. Would love to work with these lovely fabrics and the awesome books! •	I don’t have a Layer Cake yet, but they sure look yummy! I like the fact that I do not have to spend time finding coordinating fabrics..it is already done for me. I love the instant coordination of the layer cakes. Just what a need to make a new baby quilt. 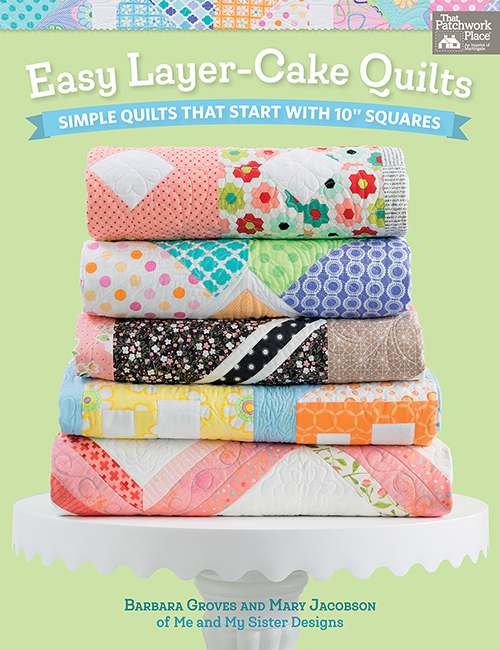 I have never heard of a layer cake quilt but it really looks fun! I would love to try one with my niece who is just beginning to learn how to sew. WOW! Two giveaways? It’s really generous of you all, thanks! I love pre-cuts, espcially Layer Cakes which are fabulous and these patterns in these two books by these two girls work it out perfectly. I love the instant coordination so I always end up with a quilt I love! Less cutting, more sewing, and they are so much fun to look at and touch! Yummy! I love the versatility of using a layer cake and that they coordinate! I love layer cakes because they save me time and I know my color choices will always be spot on. Also I get o see and feel all the fabrics from that particular line. Help! I’m a beginner and truly need guidance and direction. These books would help! I loved the frolic fabric so much that I already purchased it but don’t know where to start:). Layer cakes give a wonderful range of colors and patterns that coordinate beautifully without having to agonize for hours at the fabric store! Not only do you get at least one "slice" of each fabric in the fabric collection, but the squares can be cut into rectangles, triangles, charm squares and mini charm squares. Fabric coordination. I have a hard time picking pleasing combos. I most love getting variety in one package – the coordination and selection.
? ?easy to store?? Meaning they are collectible and don’t take up much room! Love to use them as well. I love that I can get a wonderful variety of fabrics (styles and colors). And, of course, the less cutting more sewing part, too! Every fabric in a collection and time saving of cutting from yardage. The fabric coordination and having to cut less. What’s not to love. I love layer cakes! The coordinating designs would be my favorite feature, as well as the nice size. I would love, love, love to win this! I love the prints by Me and My Sister! They are always SO happy! Layer cakes are the best!! The fabric will automatically all go together and there is so much variety in the patterns you can make. These gals design some of the happiest fabric around!! I love them all!! Instant coordination and so easy and fun to use! Less cutting more sewing. I love their fabrics! I’ve got the layer cakes! And, no, I haven’t done anything with them yet… I promised myself I’d finish some UFOs before starting something else. But, you’re book might just cause me to re-evaluate that promise! Layer cakes are a nice size to work with plus I love having the fabrics coordinated for me. I have an Accu-quilt Go Big cutter and the Layer Cake works perfect with my dies and provides even LESS cutting time and more time to sew. Having all the coordinating fabrics at hand adds to a super unique/colorful quilt design, too boot. I’ve never used layer cakes but I’d love to try! Less cutting and a pretty set of fabrics. I haven’t used layer cakes yet but I think the coordination of fabrics would be very appealing. I love the instant coordination and the fact that you get a wide variety, one (or two) of so many different fabrics. Less cutting and more sewing. And love having the colors and designs coordinated for me. Instant coordination and lass cutting! Layer Cakes are the best! I don’t have a Layer cakes yet, but this one looks fun, and the books would be the push to use them. I have dozens of layer cakes – easiest way to get the entire line of fabrics (I especially LOVE Me & My Sister fabric lines) and they can be used in more ways than I can count! Love them! Love the crisp clean designs on these . So easy for projects,cut colours and coordinated just ready to sew. Bring on the layer cakes. Yummy. What I love about the layer cakes are the coordinated availability of so many different colors with so many different ways to cut them. They always seem like just the right amount of fabric that I can use alone or with something from my stash to enhance the fun. Great size! re-cut them to other popular sizes. I have many layer cakes, they are my most wanted size in pre-cuts. Less cutting so you can get right to sewing. I don’t have a layer cake yet but they look like fun and beautiful colors. I love layer cakes because they are so versatile and all the fabrics go together. I don’t like to try to match fabrics and layer cakes are large enough to make several different patterns. The patterns in the book "Easiest-ever layer Cake Quilts for Beginners" and "Easiest Layer Cakes 2 are perfect for Moda’s Frolic layer cake. Layer cakes are easy to use and no color matching, limited cutting and the best part limited to no waste! OMGosh I just love those sweet layer cakes! You can do so much that is quick and easy like make 8 of those cute little half square triangles or a whole of 5 in squares and put them all together in your batter and bam! you got a easy peasy beautiful quilt! I have never purchased or used a layer cake packet, but love looking at the beautiful coordinated fabrics – they always look so pretty. I am a fairly new quilter. The books look like there are some versatile patterns in them. Wish me luck!! I just love getting a large size swatch of a coordinating fabric line to pet and fondle. haha I haven’t made a layer cake quilt yet, just collecting them. I will be checking out these pattern books, for sure. Thank you for the beautiful inspiration!! Happy Stitching. I love layer cakes because you get the full range of fabric, and they coordinate beautifully together. Also it’s so convenient for me that they are precut, as I have only a very small space for cutting. I love layer cakes because I get fabrics that are already coordinated. It is easy to manage cutting down to other sizes or use as is for numerous quilts. I don’t have a layer cake yet but they do look yummy. The sisters certainly make them look that way. I would love to have their book. Love the color coordination and the size is useful without being too huge or too tiny. Easy fabric selection AND less cutting and more sewing! So convenient…. I love layer cakes because you can get a nice amount of fabrics that all go together! I like the coordinating fabric and the cutting options of a layer cake. Layer cakes are my favorite way to get all of the fabrics in the Moda lines I love. They can be cut into charms or strips, and are just so versatile! What I love about layer cakes is the variety of fabrics and that a lot of the cutting is already done for you. Thanks for the opportunity to win. Looks like fun . Layer cakes are my favourites because a whole collection of co-ordinating fabric pieces always come in the same bundle making it so much easier to blend when you are making a quilt. I love the variety of prints in a layer cake. But, I also love that I don’t have to do as much cutting. Love, love, love the instant coordination. Layer cakes are my favorite pre-cut. They are so versatile and can be cut down to charms for those projects require more than one. I love layer cakes. You can cut them into 5″ charms or use them in so many ways in quilts. I love that you can see the print clearly without being cut up in a 10″ stack. I love layer cakes for several reasons. First of all, the coordination of fabrics saves considerable time pulling, or purchasing, fabrics. Second, a layer cake can be cut into so may other sizes without much waste. Third, I know for most projects, the cake will be mostly used thus saving on the amount of scrap fabric leftover. I love scraps but they tend to become overwhelming very quickly. Thanks for sharing these ideas from the publications and for offering a giveaway. I like layer cakes- the fabric is good sized, already cut into usable pieces, and you get cordinated fabric so projects sew faster. Instant coordination of color and fabric is my number one reason for using layer cakes. I struggle with color selection otherwise. Thank you!! Less cutting and more sewing!!! Although instant coordination is a real plus!!!! Less cutting! Less cutting! Yay! I am love with the 10/10″ layer cakes because of the size is perfect for less cutting, and there is so much for your to do with them. I will buy them first. I love the coordinating fabric. Most of the time you get the whole line. I like to see all of what is out there to pick from. Bright colors are my FAVORITE to work with. Love the easy cutting of layer cakes and love these easy patterns. I love using Layer Cakes because you can do so much with them, from sewing the cakes together to making 1/2 square triangles. And I love the two books from Me and My Sister. They always have such great ideas with clever shortcuts to make beautiful quilts. Love layer cakes for quick projects. I use them for baby quilts, purses, and quick wall hangings. I do not have any layer cakes, just charm packs but it is wonderful to have all these packs coordinate. You can’t go wrong with precuts of any size!! I would love to have the book/cake combo to give these "cakes" a try. Thanks for a chance to win. Layer cakes are a great jump off for so many patterns AND the fabrics all go together. I love the coordination so I buy lots of layer cakes – then I don’t know what to do with them! I love layer cakes because all the fabrics are coordinated and it save me time. The size is perfect for cutting down and creating so many different blocks. I usually buy 2 identical layers cakes so I have even more quilting options. I love layer cakes because the fabric selection is already done and cutting is easy. They give you more options than a charm pack because of their size. I love the variety in precuts! Instant coordination! Plus the ease of cutting…. they just are beautiful and easy! The coordinated fabric is my favorite part of layer cake pre cuts. Me and My Sisters designs have the happiest colors in fabric around!!! Instant coordination! Especially love those bright, happy colors like Confetti! I used a layer cake to make a quilt for my granddaughter to auction off to earn money for a mission trip to the Domonic Republic. Less cutting….more sewing time. What a great giveaway!! Thanks for the chance to win. The layer cakes are all coordinated and offer so many choices. Definitely, less cutting and more sewing with layer cakes! I love the instant coordination—fabric selection is so much easier. I like less cutting more sewing. Get it together faster! I like to get on with the sewing!! I am also working with my granddaughters to learn to sew. They want to make a quilt for their soon to be here baby brother, and layer cakes are perfect to work with!!! I don’t have layer cakes yet, but sure would love to win some, and pattern for the houses. I haven’t used Layer Cakes yet – but the ideas in the two books look awesome, and having those books would inspire me to buy a few Layer Cakes to try out! Instant Coordination of the fabrics so that part of quilt planning is taken care of enabling you to start working immediately. I love the color collections and the fact that there is less cutting. Leave it to Moda to come up with all these things to make a quilter’s life easier. Layer Cakes have enough fabric to do interesting things with them and the fabrics are well coordinated. I love the instant coordination of colors and fabrics. Selecting colors for a quilt is one of my biggest fears in quilting. Using a layer cake makes it less stressful and easier! Love my layer cakes!!! I love the coordination of the fabric, the less cutting factor and the fact that if you want smaller blocks, it is easier to cut from the layer cakes and doubles the amount of blocks!Easy, convenient and less work. I love precuts for many reasons mostly because the fabric all works together!! I like layer cakes because you have a lot of options for cutting your blocks and you can buy it and stash it away and know that you will have enough fabric. The thing I like most is the colors match perfectly. All I have to do is decide on the pattern. I love their fabrics and the designs are fabulous! Love quilting with this fabric. Instant coordination. And no waste of fabric. They are the perfect size to make a BIG patchwork quilt! Layer cakes are so versatile! Love them. A layer cake is definitely the fastest way to get quilting – less cutting, more sewing… It doesn’t hurt to have the fabric all coordinated either! I buy layer cakes but haven’t used one yet. I want to start to make scrap quilts, maybe thisis a more organized way to start. I love layer cakes because the fabric is already coordinated for you. Instant coordination—fabric selection is so much easier and less cutting, more sewing! I love layer cakes, and I love Me and My Sister Designs! Instant coordination. Everything goes together beautifully and if you need 5″ squares just cut into 4ths. The very first Layer Cake I purchased was Grow! by Me and My Sister. They had done all of the hard work of coordinating fabric colors and print sizes for me! I could just cut and sew! Who doesn’t love a good Layer Cake? Less cutting is always good and when working with kids the layer cake make it sooo easy for them to select a success filled color scheme. Thanks for the chance to win! less cutting is super ! Thanks for the chance to win! Instant coordination–fabric selection is much easier. Otherwise it takes me forever to pick out fabric! i have a few layer cakes, but I have not tried any pattern with them because I don’t know where to start and since I am still a newbie, I had been looking for patterns, but I see now that there is a book just for layer cakes. yay…. Instant fabric coordination plus a bit of so many colors. I love being able to get a large selection of my favorite lines of fabric in one yummy package. I can get it all without needing to make decisions. No limits! The layer cake size is perfect for projects. instant coordination of colors so it sets you up for success. I’d like to be leisurely in picking out fabric & designs, but my quilting time is limited so if someone has it picked out for me, I get a lot more done! I love Layer Cakes! So much quicker to get a project done, with all the fabrics coordinated and easy to start a simple project! I love layer cakes because they make for less time cutting and more time sewing. Thank you for the opportunity to win. I love the instant coordination. I would love s a book to go with my layer cakes. Less cutting, more sewing! They’re large enough you can do a lot of patterns with them and small enough that you’re not having to wrestle with yardage. I love that the fabrics coordinate with each other and combine together perfectly in the quilt. Great idea for us newbie quilters, we can just sit down and sew! Thanks for the beautiful ideas! I LOVE Layer Cakes! You get to have a big variety of patterns and colors and with a layer cake pattern you have a quick quilt! I like layer cakes because of the fabric coordination but also if I do a smaller project, I still have enough to do two small projects! Love these books! Coordination done for me! Love them. No particular reason, just really like everything about them. I love them for lots of reasons, but mostly because they coordinate and I don’t have to spend time looking for matching fabrics except for backgrounds. I just love to lay them out and look at the lovely fabric colors and designs before I begin using them. I’ve never used a layer cake, but I love the patterns these quilts have. The fabric is already selected and if I need charms I can cut it up and start sewing. Love the color and pattern coordination with precuts. I love layer cakes for their versatility, you can do so many things with them. it is also a good buy for a whole lines varitey. I love that the complete line is available in one package. Layer cakes are the most useful of the precuts for me. Using layer cakes lets me skip the parts of quilting that can be tedious for me and lets me get to the parts I enjoy the most. Love the idea, need to try. I love layer cakes for the coordinations of prints and also having part of the cutting done! I don’t have any layer cakes but looks interesting. Coordinating fabrics & it’s essy for us who are learning. Convenience! and the option to use as 5″ squares, 10″ squares or 2 1/2 inch strips/squares. I haven’t tried layer cakes yet but would love to. I’ve been fascinated by layer cakes but have never bought one! Would love to win these books and fabric, they sound so much fun and having a few layer cakes already would love to be able to use them with your clever ideas. I haven’t tried a layer cake yet. I like that it can include a whole collection. I love that I get a bit of each fabric of the line in a fairly useful size. I love cake! I like that you get a little bit of everything. You get a variety of coordinated fabrics for a project, and if you find one you really like you can buy the yardage. I don’t have a Layer Cake yet, but they sure look yummy! This collection is so pretty. I have never made anything with a layer cake…I have two, but have yet to make anything with them. I love less cutting while you have more size choices than a charm pack. I like layer cakes because of the coordination of fabrics. And the size gives you more options for sofa size quilts. Thanks for the chance to win. I love that there is less cutting for me to do! Layer cakes make fabric selection so easy. All the prints work well together and there is no need to spend time searching for the perfect match. A layer cake gives a lot of bang for the buck when you want coordinating variety. There are times when one of those layer cakes just speaks to me and wants to become part of my fabric stash. I don’t have many but love how the fabric coordinates with no effort on my part! Less cutting, but still a lot of options! Plus I can get all or most of the colorwTs and prints in a release! I love layer cakes. I don’t have to try and put fabrics together and the size will make a variety of quilts. I can usually get the front and back of a baby quilt from one layer cake. bigger than a charm – more options! I don’t have a layer cake yet, but the ones in the picture sure look fun! I love the patterns in the book, easy for charity quilts! Great variety of yummy coordinated fabrics that are so easy to use and formulate into a beautifully crafted work of art. I love the layer cakes because it makes coordinating my fabric for quilts so stress free. Pre-selected coordinating fabric – sometimes it’s nice not to have to search for things that go well together! Wow! Wow ! I don’t have a layer cake, But the 1st quilt was just what I needed , Great inspiration. Love the concept. Less cutting, more sewing , yay! I love the coordinated scrappy look you can get from a layer cake. Plus, it’s the easiest way to get a piece of every fabric in a line! I’ve never had a layer cake. What I love about layer cakes is the fabrics all coordinate, so your project turns out wonderful! I love that all the fabrics go together! You get to play with the whole beautiful fabric line and there is lots and lots of designs that uses layer cakes. I love the selection but would love some strips to match sew I have some longer pieces to make a border & binding to match. I haven’t used many layer cakes but I do like the versatility that they offer. I love the selection, colors & variety of the smaller yardage in a layer cake. They are perfect for fussy cutting because they are big enough to still have a couple more pieces. I like that the fabrics are already coordinated for me, and the size of layer cakes is such a good size. There is a lot that you can do with that size. I love the coordinating fabric and the time they save. I adore the co-ordinating colours of layer cakes. Have only ever bought them once, but already used in two different projects! You can do a zillion things with them! I LOVE LOVE LOVE layer cakes! Layer cakes are terrific for fast & easy quilts with lots of color! Love them! I do not have a layer cake yet, but they sure look yummy! Actually I want to make that flower power quilt in the most way. Thx patricia. I have not purchased a layer cake as of yet. I love that the fabrics are all color coordinated. And you don’t have to but lots of fabric! Great fun. I have not purchased a layer cake as of yet. I love that the fabrics are all color coordinated. It is great fun quilting! I love how all the fabric is coordinated and I have less cutting and more time to sew. I look to find a layer cake that I love with all the fabric in the same line. Love layer cakes! I do need more ideas to use them though. The books are perfect and the fabric is so fun. I like layer cakes because everything is coordinated. I love the fact that the fabric is coordinated and it is precut. Cutting the squares into sections is fast giving me quick results. Instant gratification makes me happy. I just love all the variety of coordinating fabrics!! Less cutting, more sewing – with less scraps left over! Thanks! I haven’t tried them yet but I’d love too. O like that it cuts down on the prep work before sewing. I love the fabric coordination! No figuring out which fabrics go with other fabrics! I LOVE the color coordination of a layer cake and having less cutting time with more sewing is an added bonus! Mary and Barbara have always inspired me with their happy colors in their fabrics! I’m addicted! I love layer cakes for the soul purpose of not coordinating fabrics! Thanks for the opportunity to enter this drawing! I like layer cakes because you get a variety of fabric for a project when fat quarters are too much fabric. I don’t have a Layer cake yet, but they sure look yammy! I love everything about Layer Cakes. It makes the planning process when making a quilt so much easier! cake I will use the layer cake to pick coordinating fabrics. Instant coordination for fabric lines I love. Cheaper than fat quarters or yardage! I don’t buy pre-cuts only because I wouldn’t want to cut into them to make a quilt; I would want to just have them for eye candy. However, if there was a specific project that I wanted to do then having a layer cake would come in handy so I would have the coordinating fabrics needed to make the quilt. I like the Layer Cakes because the fabrics are coordinating and it means less cutting. Thank you for the giveaway opportunity. The books and fabric look wonderful. I love layer cakes because I don’t need to search fir coordinating fabric. Add in some background fabric and voila, a lap quilt! So much can be done with layer cakes!! !Love cakes. Easier cutting means more time sewing. I like to see the sampling of the fabric line. One layer equal four charm packs which tranlates to those quilt patterns. A layer cake can be used with background fabric to make large traditional quilt blocks. I like layer cakes cause they are very handy, cheaper than a fat quarter and you can actually make a whole quilt with it, and also because it’s a great way to get a sample of a whole collection. Ok, THANK YOU and good luck to me! Less cutting and more sewing. I love the variety! So many prints that coordinate, and I don’t have to spend $150 to get them all! Layer cakes=instant gratification! And I love all of the sisters’ books….I’ve made many baby quilts from their patterns. I do not have any layer cakes but would love to have one and make some of the patterns shown……beautiful fabrics and great patterns in books! I love how quickly a quilt goes together. Instant coordination, of course! (And thank you for the opportunity to win this GREAT giveaway)! I love them because there are so many wonderful patterns available for them and, of course, getting all those coordinated fabrics is just too tempting. I don’t have a layer cake yet, but every time I look at Moda’s fabrics, I’m always drawn to Me and My Sister designs. Would love to try a layer cake! Instant coordination—fabric selection is so much easier. I have picked up a couple layer cakes because I loved the selection of prints, but I have not picked a pattern yet. These books would be awesome. I like that the block are coordinated, I don’t have to spend time looking for matching fabric. AND I don’t have to spend time with initial cutting of blocks. Saves a lot of time. Layer cakes are great! I had a quilt top done in 2 days instead of 2 months!!! Love how they make quilting fun and easy. And Me and My Sister are the best for happy fabrics!!! Less cutting and more sewing! I love the colors these sisters use, just beautiful. Thanks for the chance to win. it takes me forever to co-ordinate fabrics for a quilt-so i especially like that the colors are already picked for you. Makes my quilting time less stressful. I love that all the fabrics coordinate. They are easier and cheaper than buying a fat quarter of each fabric. I’ve never played with a layer cake before. Instant coordination, not to enjoin the variety with out having to purchase a bunch of fat quarters. I love the instant fabric coordination with Layer Cakes and all pre-cut bundles. I have several layer cakes that I bought because the fabric was so enticing. I have yet to use them but I certainly would like to do so after today’s post. I like that you can use all the fabrics in a series. You don’t need to choose a few. I love layer cakes because the process is not "overwhelming". Every fabric coordinates and because of the pre-cut nature, the fun can start sooner! I buy precuts when I love the fabric line and want to have a piece of each print in the collection. Instant coordination—fabric selection is so much easier. I have a terrible time with choosing fabrics. I don’t have a Layer Cake yet, but they sure look yummy! I love the fabric lots. Having everything coordinated is great. Less cutting more sewing. That Frolic fabric sure does look like a lot of fun! I love the easy coordination of the layer cakes. It makes the project take off with speed. Pick a collection of fabrics you like, and get started! Now, the only problem is picking which book/pattern to use. I might have to enlist family to add more family members so I can make all the quilts! I like how the colors coordinate – no decisions to make as far as color choice. Makes for an easy quick project. I love the coordinating prints in a layer cake. The Layer cakes are always so nicely co-ordinated and really makes life fun and easy. It is a blessing that someone came up with the ideas of these. Instant coordination AND already cut! Yum! My favorite kind of precut is the layer cake because of its versatility. Large pieces, small ones, narrow or wide, and everything in between — there’s no limit to what one can create with them. I love Layer Cakes as they are so versatile. There is enough fabric for 4 charm packs or I can cut several 2.5 strips to stitch together- just so many ways to use them! They are my go-to for table runners. I like layercakes most for their color coordination. Also most of the time part of one will another layercake. Also for blocks the smaller piece is easier to cut. I’m still learning about some of the conveniences of precuts for quilting. I haven’t tried layer cakes yet but they have my attention and curiosity. I love that all the patterns are coordinated for me and that layer cake squares are so versatile!! Instant coordination AND pre-cut! What’s not to love!!! I love that layer cakes are color coordinated and the large variety of different valued prints and solids. Most times I would not have chosen what is included, but am always pleasantly surprised at the final quilted outcome. Definitely the pre-done color coordination! I love that I can all the colors in a fabric line all in one pack! And 1 pack can make a good sized quilt too! I love the small cuts, just bright variety, and full of movement, and excitement. Love the fact that you get a bit of the whole fabric line. I love layer cakes because you can make big beautiful quilts quick!!! Love that they are already cut down from yardage. Makes it easier for me being a newbie quilter. I love layer cakes because I don’t have to think about coordinating fabrics! Easy to choose fabrics no worry about color choices or pattern. I would make the neighbor quilt… I love their simple house pattern. I like both the coordinated fabrics and the ease they provide for cutting. Around the block is going onto my “make it” list! The Layer Cakes have freed my aching body from extra cutting. Getting fabric that is coordinated also is a pleasure. Instant coordination and yet plenty of colors and flexibility of cutting into many shapes and sizes. Layer cakes open the door to limitless techniques and make sewing fun! I can get more projects finished with layer cakes. I also like to use them in craft projects. It is also nice to get the whole line of fabric. Sometimes I don’t think I will like all the pieces in the line. Then I get it and wow!! Fell in love with all of them. Thank you for there availability to all of us. I love that layer cakes have enough fabric to make a small project. You can have a huge assortment of fabrics that go together perfectly without having to buy or cut tons of yardage. I like layer cakes for their convenient size options and already coordinated fabrics! Like the Neighborhood quilt. Have not done a house quilt yet. It’s so time saving! Plus everything is already coordinated. I like how a layer cake is such a huge number of coordinating fabrics. It makes for a more interesting quilt. Love the suburban quilt, that’s really sweet. I love the variety you get with a layer cake that coordinates so well together. Sewing can start immediately. I love the fact that they are cut and ready to sew, or you can cut them to any size you need. I just love working with them. of those listed: Less cutting, more sewing. But I do love the variety of fabrics in precuts. I like that there are so many possibilities. I would make the flower power!!! I like the variety of fabrics you get in a Layer Cake. I love layer cakes because it takes all the guessing about fabrics that compliment each other! And you can get right to the project with little cutting! I like the coordinating fabrics. I like the fabric selection and coordination of fabrics in a layer cake, means I don’t Have to think about it! I love the variety and instant coordination of a layer cake. Takes away a lot of the thinking process Beautiful fabrics. Love Me and My Sister designs. I love fabric and layer cakes make it possible to have some of each of the coordinating fabrics from many designers lines. I love how all the fabrics play nice with everyone. Saves me the trouble of matching up! Less cutting more sewing! I’d love to make Flower Power. For sure Less cutting, more sewing! Don’t have any yet, but they sound yummy ! My favorite thing about a layer cake is that you get a piece of every fabric from that line! I don’t have a layer cake yet but would love one of these! The book looks fun too! I like the convenience of a layer cake. Just grab one and start cutting! Saving time….so more time to make more quilts! I like that the colors coordinate and less cutting, more sewing. I love how they all coordinate but you achieve a scrappy look! Coordinated and so easy to work with . I don’t have to do much cutting . I love that the fabric is coordinated for you & the steps saved in cutting-sometimes! I just love Me & My Sister fabrics & books. Their projects & fabrics are always so bright & happy & cheery! Where are the winners of your various giveaways published? Never hear who wins! Seems like a missing link to these wonderful blog posts & giveaways! I like that the fabrics all coordinate with each other the most. Thanks for the chance to win! I love the variety of patterns and less waste in a layer cake. Easier to manage cutting and great for smaller storage areas…we are RVing full time! Thanks for the chance to win! I love the coordination. It stresses me our when I’m selecting fabrics for a quilt. The only thing I need tow worry about is the backing and sometimes the background fabric. Love that all the fabrics go together! I’m terrible at choosing fabrics! LOVE LOVE LOVE layer cakes for quilt projects because of their versatility and the coordination of fabrics. It’s always fun to see the fabric combinations packaged together! Best way ever to get a whole collection in one pop. Layer cakes don’t take up a lot of room and I get to see a slice of each of the fabrics in a particular line and order yardage of my favorites. I love layer cakes! Less cutting, more sewing! I love making quilts and pre-cuts are the way to go! I actually have never used a layer cake. I’m interested in it though. I like layer cakes. I have about 3 layer cakes and would love to have some patterns for these. I love the coordination of the fabrics and that they are all ready to use. Love precuts! So easy to work with and save time. I really love flower power! So bright and modern 😍! It’s definitely the one I would make first. Layer cakes "spark joy" for me. They help me make combinations I wouldn’t have thought of and they save me precious time coordinating fabrics. They are easy to store and I find I have less fabric leftover. Makes a nice size quilt with a nice variety of fabrics. I love that you can use it as is or cut it up to make a variety of pieced quilts. I love the variety that layer cakes provide. To get a 10” piece of fabric you would have to buy a third of a yard, and buying that many 1/3 yds would be very expensive! I have a couple of layer cakes but I haven’t used them yet. I’m looking forward to purchase one or both of your books in the near future so I can use these beautiful layer cakes that I have. Thank you for the opportunity to win a prize! Layer cakes are great because you get to use a variety of fabrics from a collection. Since they are precuts they also save cutting time. I love the ease of a coordinated pack of fabrics all in one pack. I mostly buy the layer cakes because I can always cut them down if I want to make some smaller blocks to mix in. Add a background and a border for a bigger quilt. I want to be a winner! I love layer cakes because they are already coordinated. No more drama looking at fabric for hours trying to see if they will work with each other! They’re already cut and easy to use. And they can be cut into lots of other sizes: charms, strips, and can be made into large HSTs. These quilts look so fun to make😊 normally I am a fat quarter hoarder, but this looks like a fun change! I love that layer cakes are already coordinated. I would love to make the trip around the block. I LOVE the patterns and fabrics of these two ladies … I Love that their fabrics are so cheery … I have a set of two Charms Packs and a Layer Cake (same fabrics) .. but since I don’t have any of their books.. have not used them yet .. Would LOVE to win this !!! I love layer cakes because they all coordinate and it is easy to make a beautiful quilt! And I am sure I would love less cutting. I always spend so much time agonizing over getting cuts perfect. I love that it is Less cutting, more sewing!! I love the fact that precuts leave more time for sewing!! I love how quickly layer cakes go together, and how little waste fabric there is. And, of course, the easy coordination of fabrics is a huge bonus! Saves the hassle of coordinating fabrics and you know it is going to go together well. and ifit is a me and my sister you know you can use the leftover in any of there other designs. Layer cakes are a great way to see a whole collection. They are so versatile. For instance, I can use any large print as a center for a medallion quilt and use the coordinating prints in pieced blocks to surround and enhance. What I love most about layer cakes is I do not have to worry about choosing the fabric. I buy them to sample a collection, I then add half yards of a few favorites. There are some great layer cake patterns out there. That flower power looks gorgeous!! I only have one layer cake so far. But I love the size of the fabrics and the fact that they coordinate. I really like the Suburban quilt design – I’d have to start with that one first! Love Around the Block! So happy! I like the ease of the color selection. I over think when choosing fabrics. I’ve never used a Layer Cake but I’ve always wanted to learn how. I love the color coordination and pre-cut. I’m a beginner so I don’t know much about layer cakes, but they definitely sure look yummy and a great place to start! I’ve got a couple of layer cakes, but haven’t used them yet. I like the selection of fabrics you get in them. Less cutting is always good. Less cutting/less mistakes. Love the coordinated colors. I have not used layer cakes yet, but I do like that the color coordination is done for me. I love the instant fabric selection of a layer cake. I have not tried layer cakes, but I think the time saved on cutting would be fabulous and having the prints already picked is a win win. Both of these books look like great fun too. Absolutely love all these prints ! Love the quilt of small houses ! Love that they are versatile. You can make charms or mini charms too if necessary. An affordable way to get the lines we love! I love that the fabrics are coordinated. I love the instant coordination, sometimes matching fabric is stressful! I love having the whole fabric collection coordinated in the layer cake. It’s also easier to cut. I have quite a few layer cakes, so these books would be ideal for me, and the fabric is so cute. Thank you for the chance to win. I love all the pattern options of using a layer cake!! And it’s an easy, inexpensive way to get an entire line for the foundation of a project!! Thanks for the giveaway!! I love that they afford me the ability to buy oodles and oodles of them, yet be able to easily store them in a very compact way. I also love that they give me just enough of each fabric to create projects with little to no waste. I like layer cakes because they give me a nice selection of coordinating fabrics that are easy to work with to produce a beautiful quilt! I love layer cakes because you get a little bit of each of the designers fabrics in the collection. They are such a great jumping off point to make any quilt. All the hard work of coordinating fabrics is already done! And if you fall in love with a couple of the prints, you can purchase yardage too. I love the instant coordination! My quilts always look great when I use a layer cake. Precut Layer Cakes are fun to use because it gives you scrappy quilts with coordinating variety. Love Mary and Barb, Me and My Sisters Designs are one of my favorites!! I don’t have layer cake yet, but they sure look yummy ! Instant coordination and the name. Instant coordination and less cutting. Win, win!! I have an obsession with buying layer cakes but I never find the perfect pattern for using them! So my favorite thing about layer cakes is buying them!!!! I love flower power. It’s a happy quilt. Less cutting, more sewing. I’m blind in my left eye so cutting (accuracy) is a problem. They are all coordinated fabric, gets you sewing faster than digging out a ton of things to try to match up. I find it fast for cutting and sewing. Great colors. I like seeing and using a whole line of fabric. I can use it in a quilt or bag pattern with confidence it will look great. I have never tried a layer cake but am interested in trying since these patterns and fabric are so cheery,bright and colorful. The projects would make lovely gifts for my granddaughters. The thing I love most about layer cakes is the instant coordination, but close behind that is that there is less cutting time and more sewing time! I like the wide variety of coordinated prints in a layer cake. I like layer cakes because the fabrics are already coordinated for you. Also with a ten inch block you have lots of size alternatives to choose from. It is a win win! I have not used a layer cake yet. They do look like fun. I love layer cakes because of the coordinating fabrics. I love a scrappy quilt making layer cakes an easy choice. Thank you for the opportunity to participate in this giveaway. I am excited about the books. I have purchased numerous layer cakes because I loved the colors of the collections. I haven’t done anything with them yet because I didn’t know what to do with them. I would love to win the book and fabric it has great ideas and the layer cake is beautiful. Love the Round the Block quilt pattern! The charm pack is just adorable too. I have to get it! Less cutting more sewing. plus you get to see the whole line and can go back to get more of the prints you lie best. I like that they all coordinate! What I love the best is the great selection of fabrics all in one fabulous layer ! I have a gorgeous layer cake that I have been petting for a few years now just waiting for the perfect pattern. I love layer cakes because you get some of each fabric in the collection. They are meant to coordinate so you are ready to cut and sew. Wow! These layer cakes are making me "hungry" to make a quilt. And those books! What delicious patterns! Thanks for the chance to win! Layer cakes are my favorite pre-cut. I love how with them, there is instant coordination—fabric selection is so much easier. Plus, the reason I like layer cakes the bet is that I tend to fall in love with large designs, like huge roses, etc… So you can choose not to cut those any further and use them as 10 in squares, to keep the whole picture in a quilt.I love Me and My Sister!!! I don’t have a Layer Cake yet, but they sure look yummy! Would love to try one…. I love the coordination of the fabric plus the size allows for lots of options! I love the variety of fabrics that all go together! I love the fabrics in a layer cake! I tend to enjoy scrappy looks to a quilt so the easy coordination of the fabrics keeps it modern! I like the coordination of colors. I love the coordination of layer cakes along with their size. You get the total ‘feel’ of the design more with the layer cake then with the smaller precuts. Thank you for this offer. I like layer cakes because they coordinate beautifully and because the pieces are small enough to handle easily, but are large enough to give you choice in block design. I love the fact that they are so color coordinated! I’d have to say all of the above. Such fun bright colors. Thanks for a great giveaway!! I think the 1st one I’d make is the flower Power.. would be neat to see how it would come together with the same kind of fabric.. I don’t have a Layer Cake yet, but they sure look yummy! Can’t wait to try it! Thanks for the giveaways! 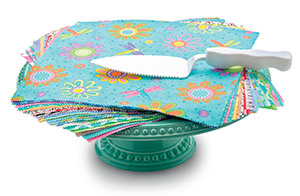 Layercakes are a very versatile precut and the fabric coordination is done for you! Cutting fabric is not my favorite part of quilting! Thanks for the giveaway! I love the quick introduction to new fabrics that helps me decide which one to get in yardage! And the package of coordinated fabrics gets my creative juices flowing so I am hyped to get sewing! I still struggle putting fabrics together so I absolutely love precuts, and Layer Cakes are just the right amount of fabric! They’re my favorite. I’ve been collecting layer cake patterns but I don’t have a "cake" in the house. I haven’t tried a layer cake yet but having the books and fabric ready to go would sure make it easier to figure out a pattern to use. Thanks for the chance to win. I love the beautifully coordinated fabrics that don’t require a lot of cutting. At least with a Layer Cake bundle I have a pretty quilt unlike when I make a real layer cake and ice it and looks like a mess. In 75 years of sewing I’ve never had these precuts but I am anxious to get started AND those books are irresistable! Thanks for pulling my name! I like layer cakes for all the different coordinated fabrics in one package. I love layer cakes and any other precut fabrics, definitely instant gratification. When you purchase precuts everything is color coordinated and all set to go. I love the quilts displayed and love all the bright colors. It’s a great giveaway and hope I win. I like getting all the coordinating fabrics in one bundle. With the larger sized pieces, I find I can use a great variety of patterns. I use layer cakes as a"stash enhancement" tool. I pick colors that i do not have in the stash. Love the brights, so cheery. All of the above, especially "instant coordination"! Love layer cakes, fabric already pre-cut and cordinated for you. Time saving so more time to quilt. I love these fabrics and the designers! I love the coordination of fabrics and how easy it is to jump right in to make something. Thank you! Less cutting and more sewing,because of my arthritis. Less cutting and variety. Barb and Mary make it fun! I love the fact that the fabrics are coordinated because that means instant sewing. No digging through my stash finding fabrics that work together!! It means getting to the best part right away! Instant coordination for sure. I love having all the beautifully coordinated colors figured out for me. I get the entire selection of fabric that coordinates perfectly and the layer cake can be cut into charm squares, mini charm squares or logs or strips. I think it’s the most versatile of the precuts. The book looks great! Layer cakes are terrific because you get a beautiful selection of coordinating fabrics and lots of ways to use them. Love the quilts in the new book! 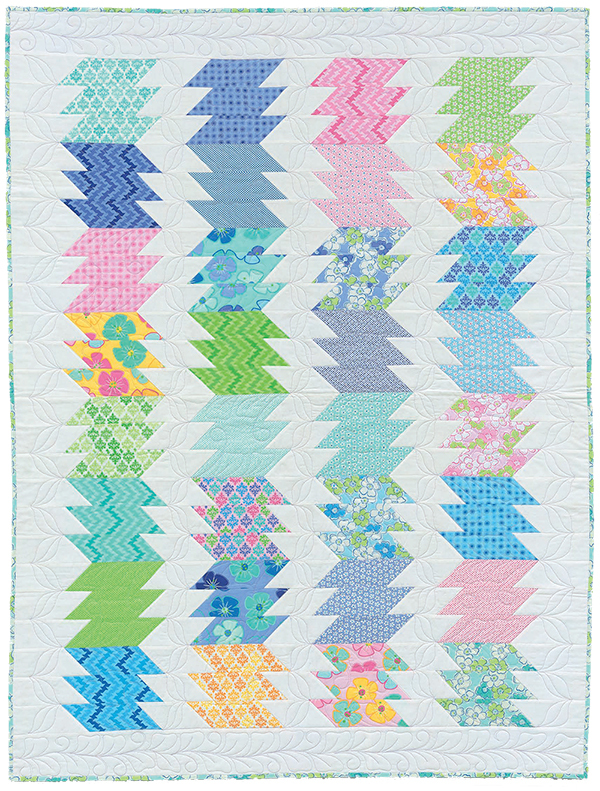 Instant coordination is so helpful, plus a large variety of different fabrics, which always makes for a cute scrappy quilt. Instant co-ordination is a plus for me! The books look great! I love layer cakes because you get at least one piece of fabric from the entire line. Also, I find the smaller size easier to cut and work with. Less cutting, more sewing as well as the easy fabric selection. I’ve neve used a layer cake packet as I prefer to cut layers from my fabrics. These quilts all look like fun. I love how layer cakes are already coordinated as well as cut and ready to go sew. These sisters are lots of fun! I love cake layers an have quite a few I need to use. Would love to win these books to help me get a start. Instant coordination and you can get started sewing faster. I love how the layer cakes are so coordinated and there is less time spent cutting and more time sewing! Thank you for the opportunity to win these books. I love less cutting, more sewing! The pieces are big enough to use in a variety of ways. Layer cakes are just fun to flip through! I love the variety of fabrics and how they all coordinate! Half the work is done for me! I love instant coordination and less cutting with layers cakes. They are my favorite Pre-Cut. I like the fabric selections. It is all done for me. I like the coordination of the fabric line and the fact that the 10″ square allows for quite a few cuts. I love the coordinating fabrics in one small package . . .. it’s my most challenging part of quilting solved. Layer cakes save time with cutting and color selection. I love using them! Instant coordination—fabric selection is so much easier. Love all of the different fabrics in a layer cake. Must say have never purchased a layer cake. Have drooled over them because of the many fabrics from one line of fabric. Love the zigzag pattern! 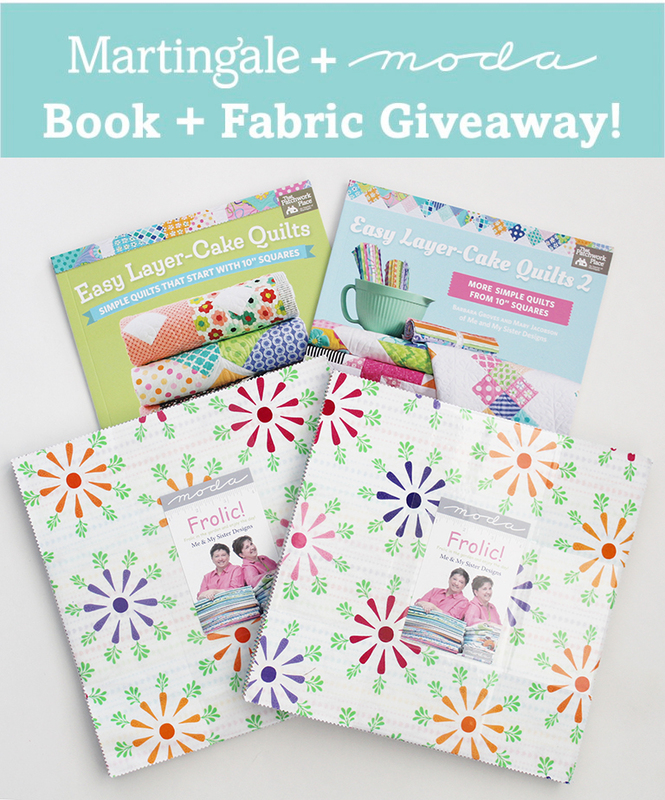 Thank you for this giveaway opportunity for the Me and My Sister Design books and Moda fabric!! I have a couple layer cakes, but never figured out what to do with them. I haven’t ever had a layer cake but I think, like a charm pack, it would be wonderful to have a stack of coordinating fabric right there to choose from!! I like the fact that you don’t have to do much cutting with a Layer Cake. So easy to use and color coordinated! Less cutting, more sewing. I have arthritis, so I appreciate that the initial cutting is done for me, and is accurate, to boot. P.S. Thanks for choosing such cheery designers to highlight and giveaway! I love that the coordination is done for you! Plus you can cut the 10″ into so many different sizes, in case you don’t want to use them as they are. I have never used a layer cake, but I have been thinking about it. I love using layer cakes to save time and I love the variation of print/color in a layer cake! Layer Cake packs allow me to keep a more organized sewing room. These books will give inspiration. I enjoy using layer cake. I am able to use a whole line of fabric without thee pence of buying yardage. The layer cake automatically coordinates. Part of the cutting is done for you also. Less cutting means you can get to the fun stuff sooner! Layer cakes allow variety without effort. Love layer cakes save time without cutting. I love the variety in a layer cake and you done have a lot of scraps left. I love layer cakes because of the variety and instant coordination. I use them often. I like the coordinated fabrics. Recently made a quilt for my grandson according to a nautical theme, and all the colors and patterns were pre-chosen for me! Love layer cakes for their versatility and they all coordinate nicely. Very affordable way to get one of each of the prints in a fabric line. Also, they can become charm squares quickly. I like layer cakes for their wonderful colors and the variety of ways they can can be used. Instant coordination—fabric selection is so much easier, and I don’t have so much leftover fabric for my stash.I’m trying to use up that stash! I love the Instant Coordination and getting the scrappy look without having to pick out the fabrics! I don’t have a layer cake yet but they look yummy. Layer cakes are a little bit of the whole line goodness! So fun! Love the coordination in the layer cakes, getting multiples of the same print from some companies or the entire line in all colorways. less cutting and color choosing already done. I can agonize over which fabrics to use, and then take forever doing the cutting. I really would love to have that book, and another layer cake! Less cutting, more sewing. Also, the 10″ square is so versatile and the fact that a layer cake includes 42 squares mean the possibilities are expanded over a charm pack. Love layer cakes! The variety within the collection gives great coordination of colors. I love that layer cakes give you so much variety in what you can do with them and the fabrics come together so well! I like the coordinating colors of a layer cake. They are easy to store. I prefer to buy yardage but when small amounts of fabric are needed for applique, I like precuts. I like layer cakes because I don’t have to stress about fabric selection – my biggest woe! It’s easy to add some of my own fabrics when the patterns and colors already work together. I don’t have a layer cake yet, but really like the idea of pre-coordinated fabrics. I like less prep time and getting on with the fun of sewing. I love both the preselected fabric coordinates and that they are already cut. I have never purchased a layer cake but wow! These quilts are yummy! about trying to match coordinating fabrics and not waste fabric. I love that the fabrics are coordinated and there is less cutting and more time for creativity. I like that you can get such a variety of colors and styles–so pretty. Less cutting more sewing .. i love layer cakes .. i have a lovely stack ready to go ! I love layer cakes. I love the instant coordination and you get a useable piece of each fabric in a collection without the expense of a fat quarter bundle. I love layer cakes because you get to sample a whole collection of fabric that is made to go together. I like a layer cake because I spend less time ‘prepping’ picking fabric and cutting) for a quick to make quilt. I love layer cakes because someone else has already picked out coordinating fabric for me and the amount is just right for the size quilts I like to make. I like having a piece of every fabric in the collection and less cutting means more sewing! Less cutting time. I want cake! Less cutting more sewing- I have used one of their layer cakes and patterns and it was easy and fun fabric! Layer cakes offer nearly instant gratification–they save cutting time so I can get right to the sewing fun! I love the instant coordinations of a layer cake. It takes the guess work out of colour choices. I love having a coordinated group of fabrics and simplified cutting. I love layer cakes! I love Layer Cakes! The variety of designs and the versitility of the size make them a go-to item for me! I like that layer cakes take the guesswork out of choosing fabric for a quilt. definitely less cutting, more sewing, and coordinated, thanks for the chance to win. I love everything about the layer cakes except for the pinked edges. It gives me the collection and less cutting. I have not tried layer cake but what fun! I love how they take all the guesswork out of "will this look good together?" Because they always do! The best part about using a Layer Cake is you get a piece (or two) of every fabric in a particular line, and they all coordinate! I make a lot of quilts, so this really helps me to make the time it takes to make them go by fast. Oh, hands down it is instant coordination—fabric selection and a no brainer for putting things together. Color coordination and less cutting. Instant coordination is what I like best. I only own one layer cake. I bought it for a specific project because all of the fabrics are what I would have bought by the yardage if I wouldn’t have found it. I haven’t cut into it yet-still enjoying just looking at it-lol! I love the size of the pack and getting so many fabrics which coordinate. I’ve never worked with precuts before but would love to have a go as they offer such a variety of co-ordinated colours – might become a convert as all the cutting has been done! I have never used layer cakes, but they sure look pretty in the store. Instant coordination is a great feature. I like layercakes because of the coordinated fabric selection.I have a two layer cakes that I drew fabric from to add more variety in a scrap quilt I made. I’d like to try making a specific layer cake quilt. I have several right now but have only used them to pull single pieces from for scrappier quilts. If I had one or both of these books, I could change my thoughts about using my layer cakes! I like both the coordinating colors and the ease of cutting, thanks! Both coordination & easier cutting. So many pretty/cute options! Less cutting, more sewing! Love how quickly a project can be sewn with those big squares! Color coordinated layer cakes make is easy to make a good looking quilt. I love that they are all coordinated for me. Picking fabrics that go together is the hardest thing for me. Thanks for the great giveaway. I like lessscutting & more sewing,,,, I really love precuts !!! I’ve done one layer cake quilt using a disappearing 9 patch pattern. It was fun & quick. I have some layer cakes in my stash & haven’t figured out what to do with them yet. Thw books look like they could help solve that dilemma! I love layer cakes. Precuts make quilting so much easier and fun. I love that these new fabric shapes resulted in a whole new world of patterns and quilting adventures to explore. Love that you can get all the coordinates in one line and everything goes together. Saves time and mess rummaging through my fabrics. I love layer cakes because the fabrics are always coordinated and it helps me get out of my box, using fabric prints I never thought I would pick, but look beautiful together. Love having the coordinated variety of fabrics! And they are all cut out. The instant coordination and less cutting, more sewing are the main reason I LOVE layer cakes!! I’ve got several just waiting for the right patterns! Color coordination is key for me. Definitely the less cutting, MORE SEWING part 🤓🤓🤓 Thanks for all of your lovely books!!! I like the instant coordination, I really like ME & MY Sisters fabric lines, I have a few of their fabrics and a jelly roll or two. I have not yet purchased a layer cake! On my "to do" list. Less cutting, more sewing. I love to get right to it!! I love these patterns. I want to try the Zig-Zag around the Sewing room and the one with all the little houses. Ph please, pick me so I can get started. I like getting so many coordaining fabrics in a size that does not leave me with vast amounts of left over fabric. definitely the fact that the fabrics all go together! I haven’t used my layer cakes yet, just seem to collect them waiting for the right book of patterns! I love layer cakes because as a beginning quilter they are a little bit easier to use but still have a pretty quilt. I love that the fabrics all go together. I am able to try fabrics I might not normally select on my own. Layer cakes make cutting easier especially when my arthritis is acting up. I love the idea of the fabrics very easily coordinate within themselves, so you can start sewing to your heart’s content! Thanks for the opportunity. Well I just received your layer cake. I was surprised that it was so big. Ready to make Flower Power.thx patricia. I get to use beautiful fabrics without buying yardage, which would be too much for me to use.